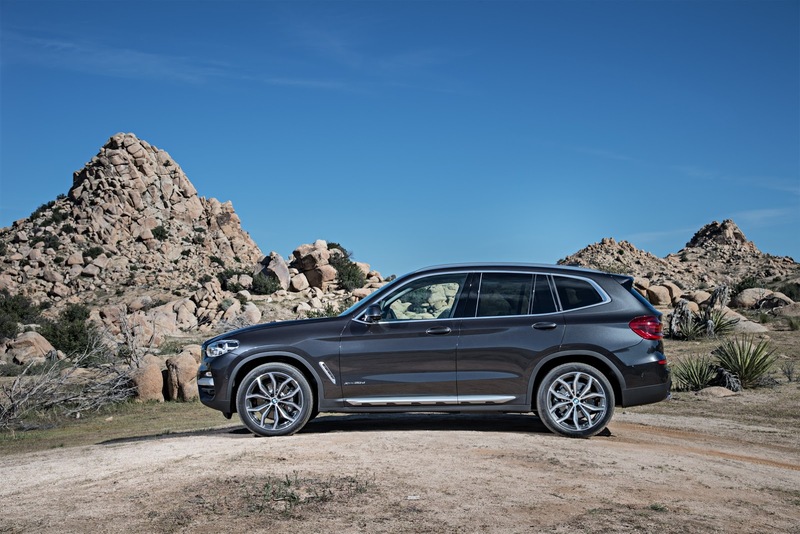 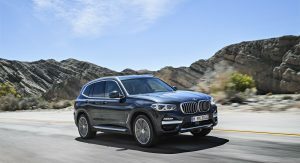 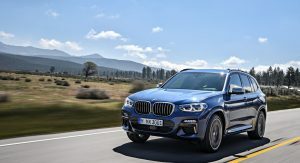 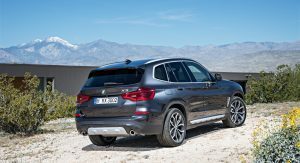 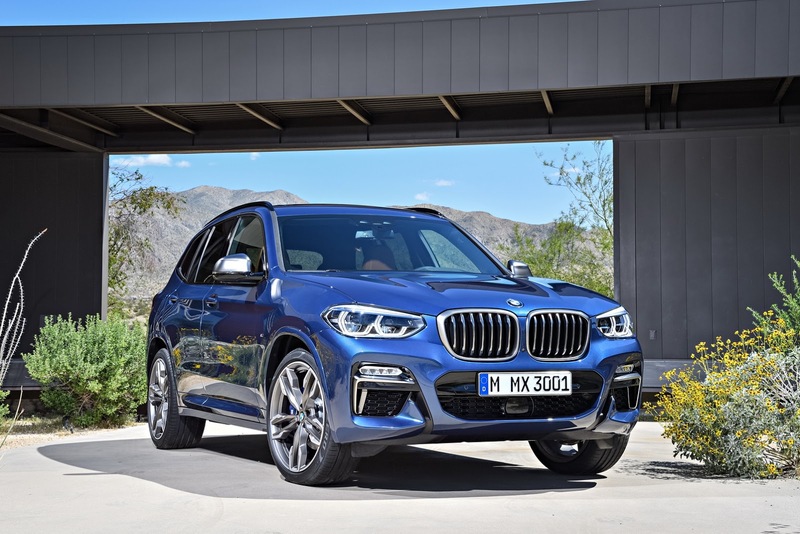 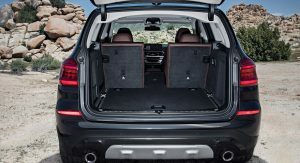 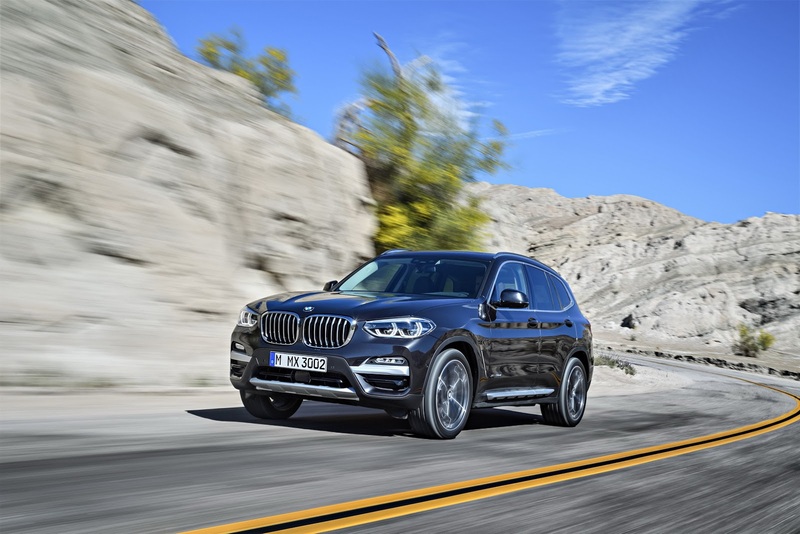 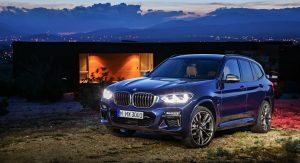 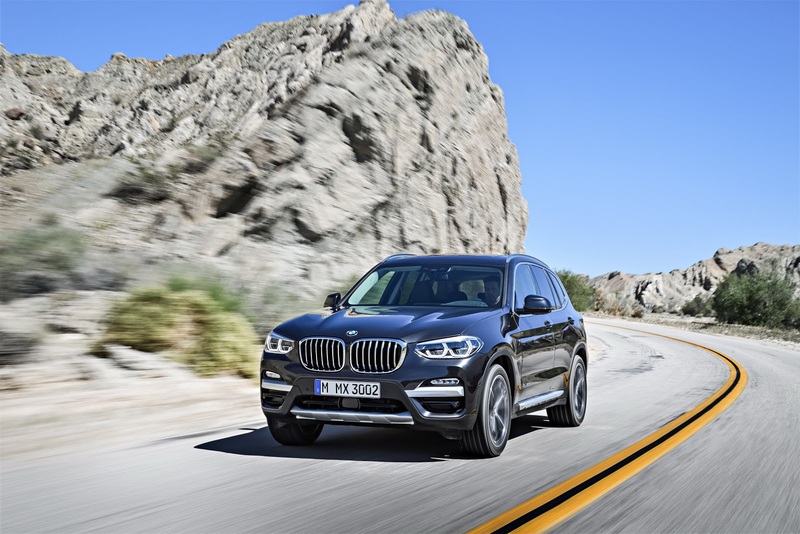 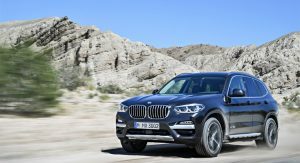 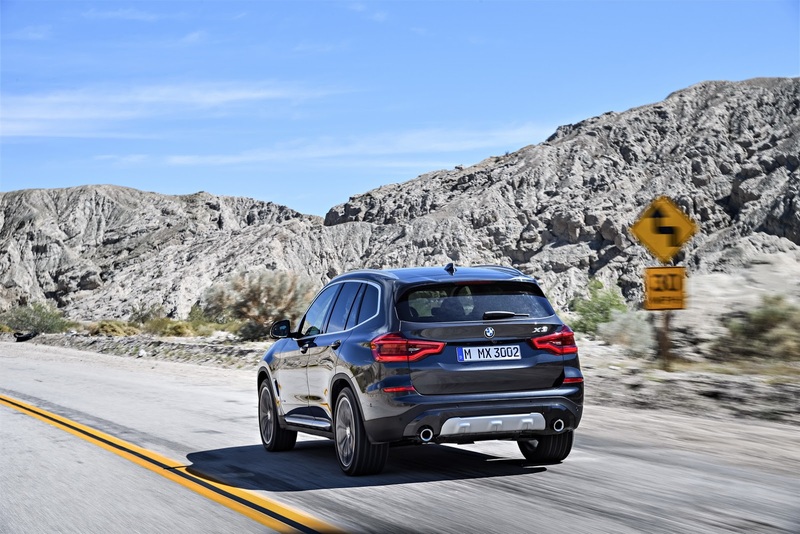 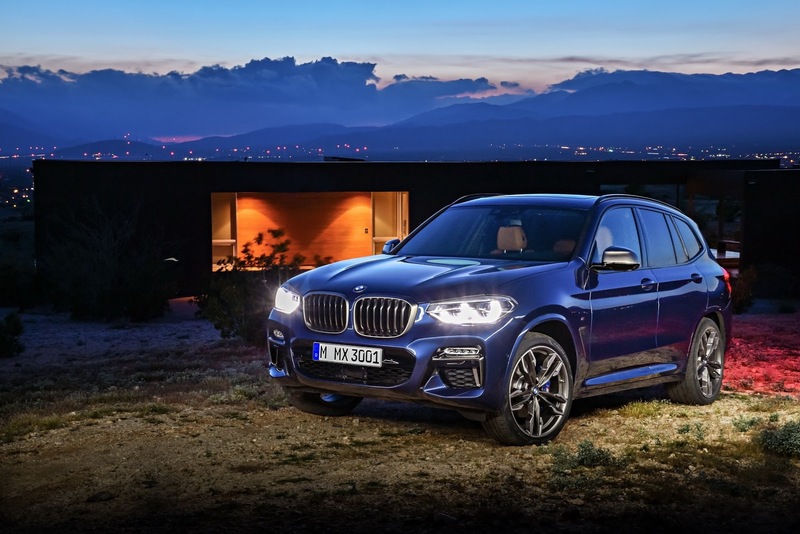 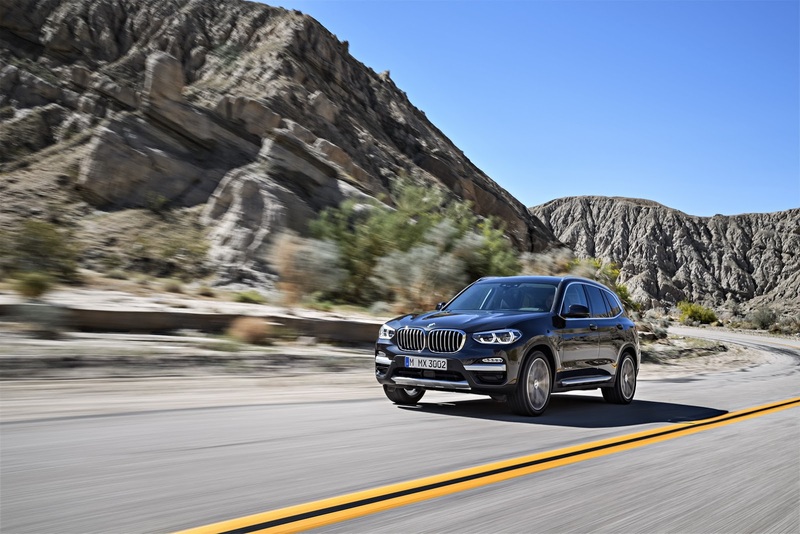 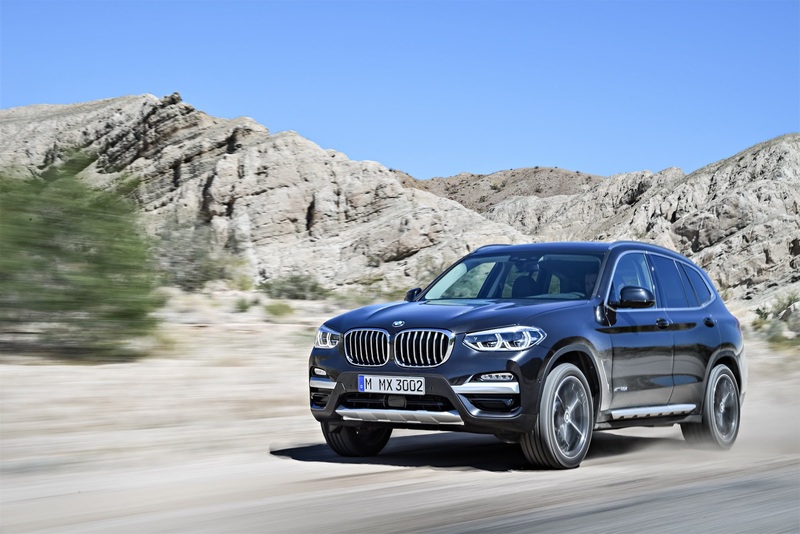 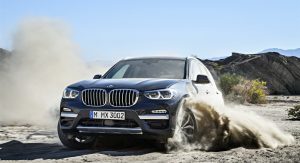 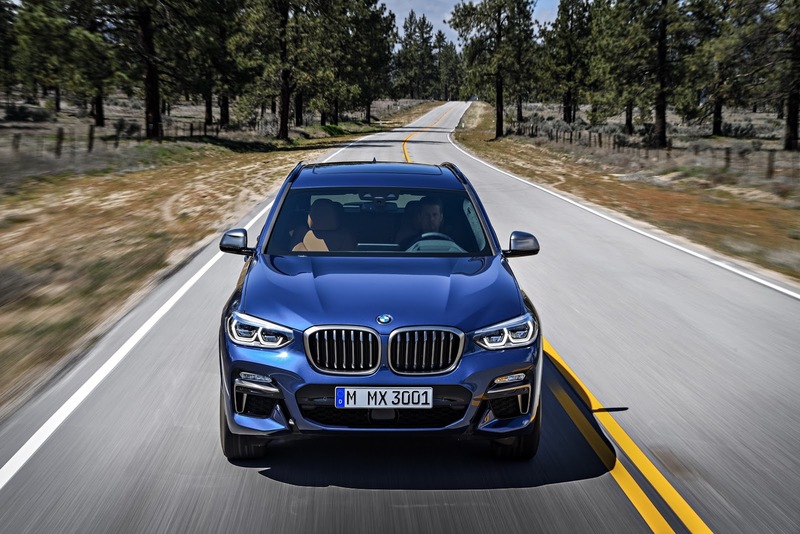 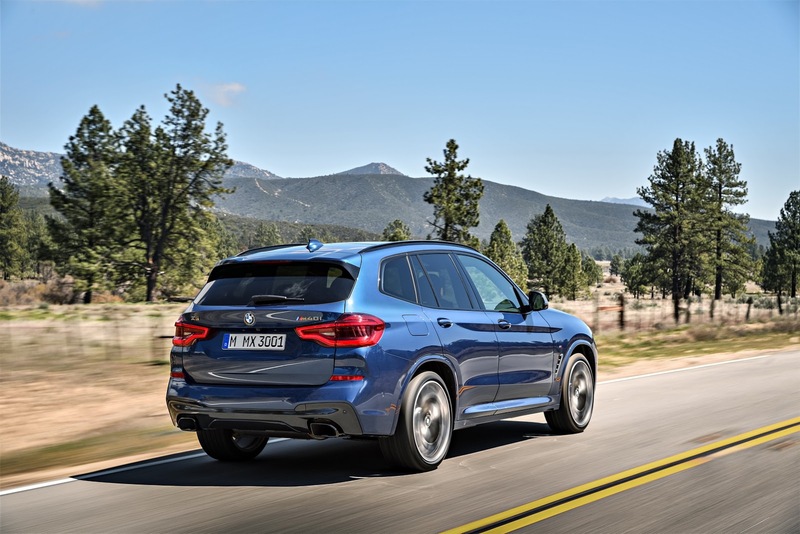 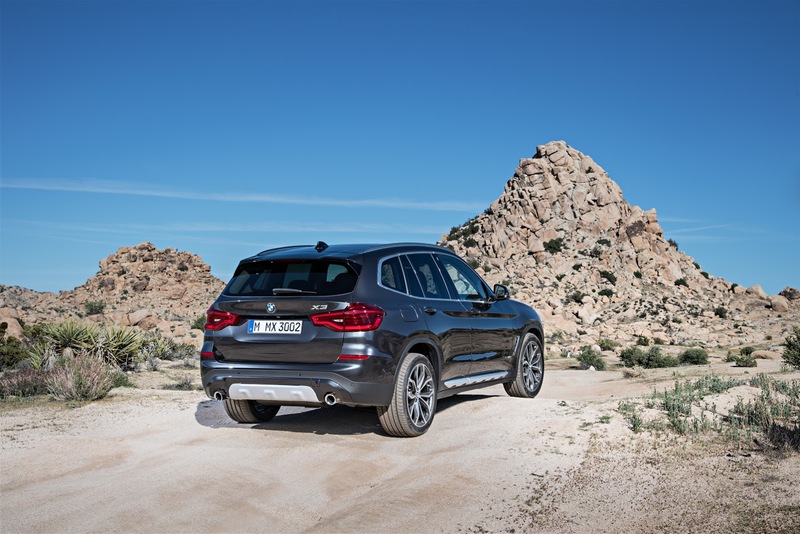 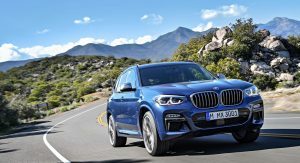 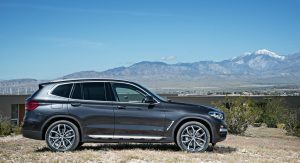 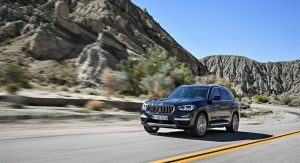 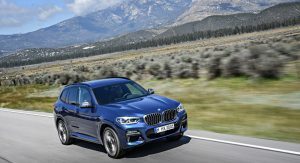 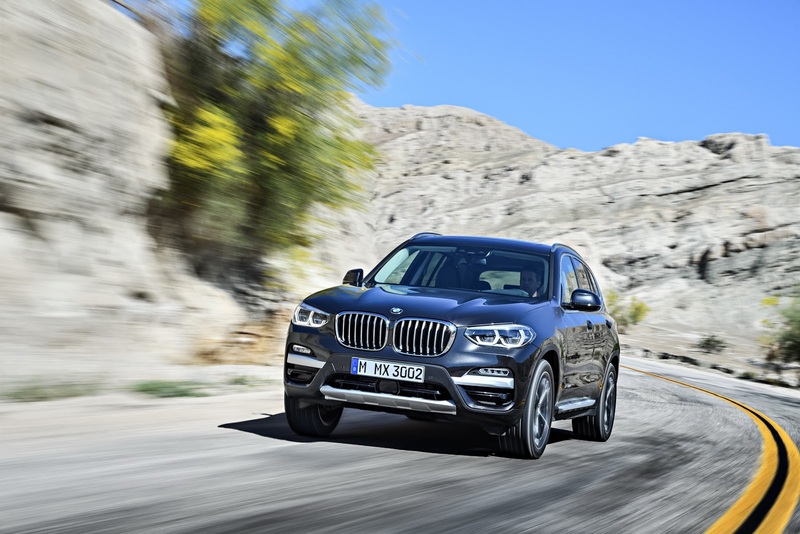 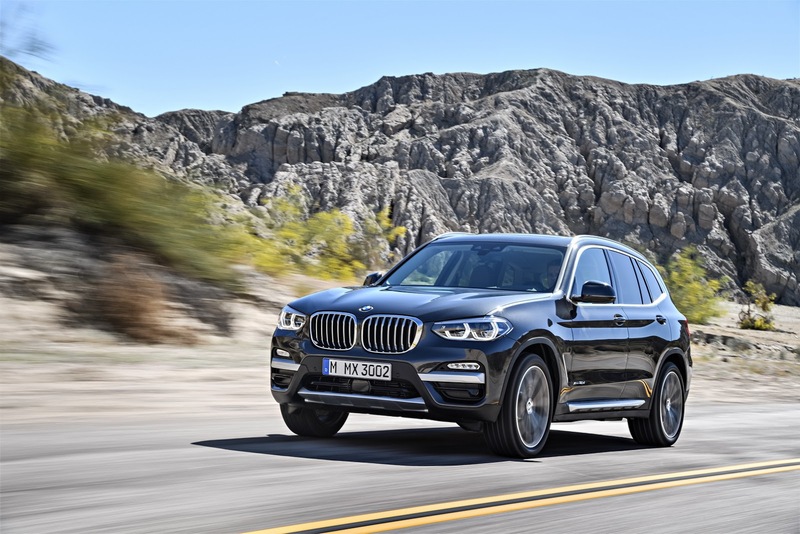 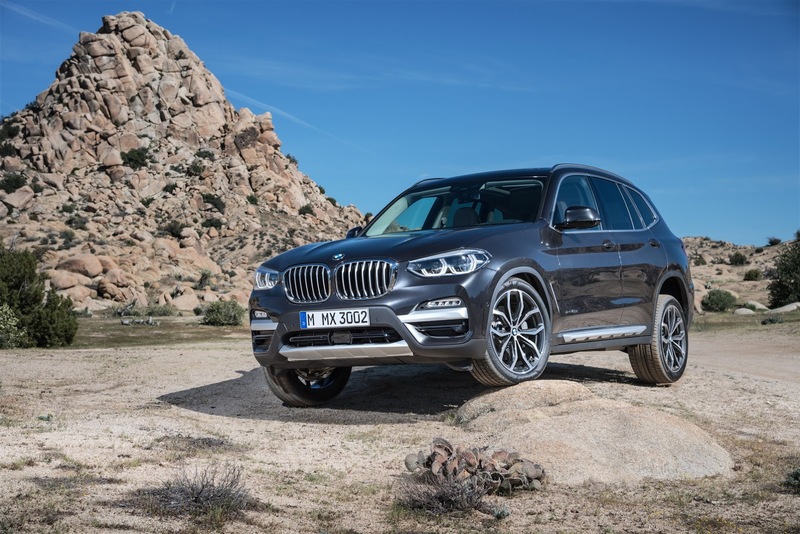 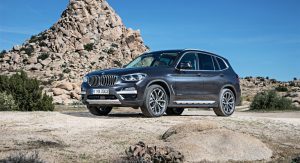 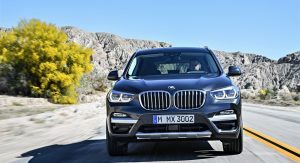 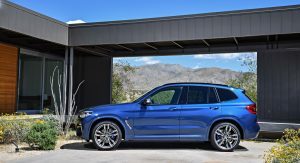 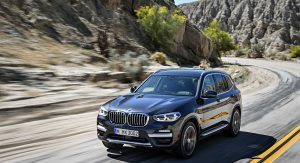 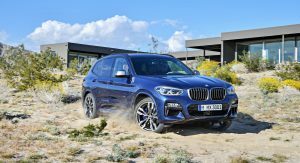 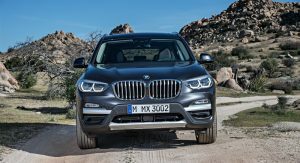 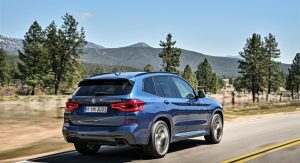 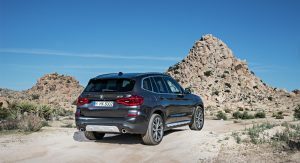 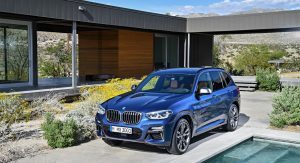 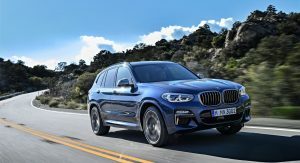 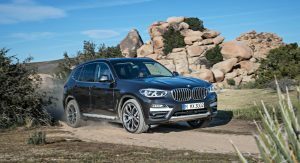 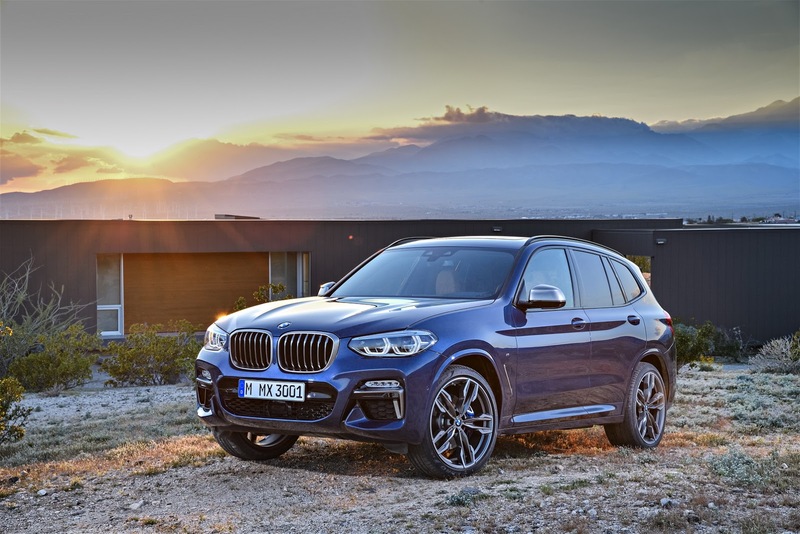 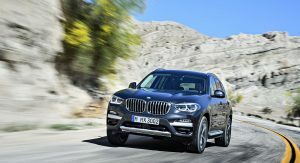 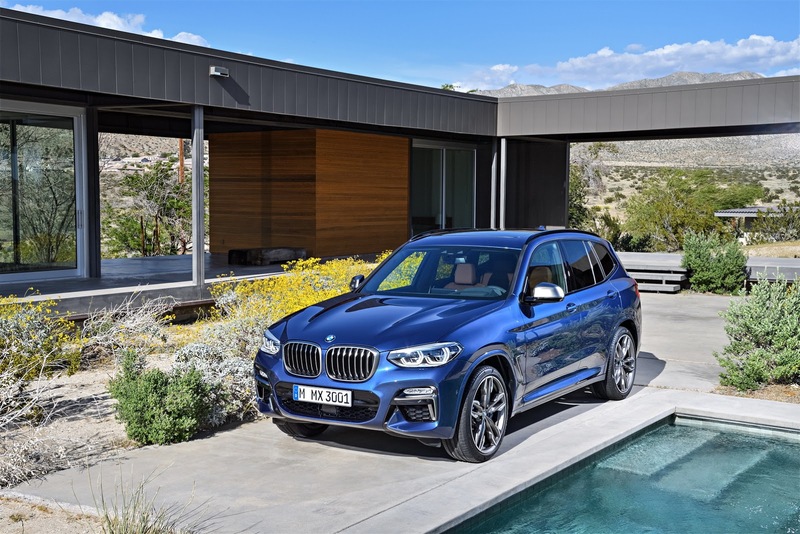 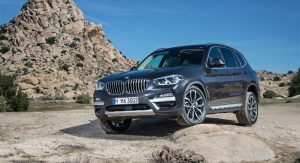 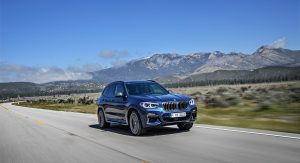 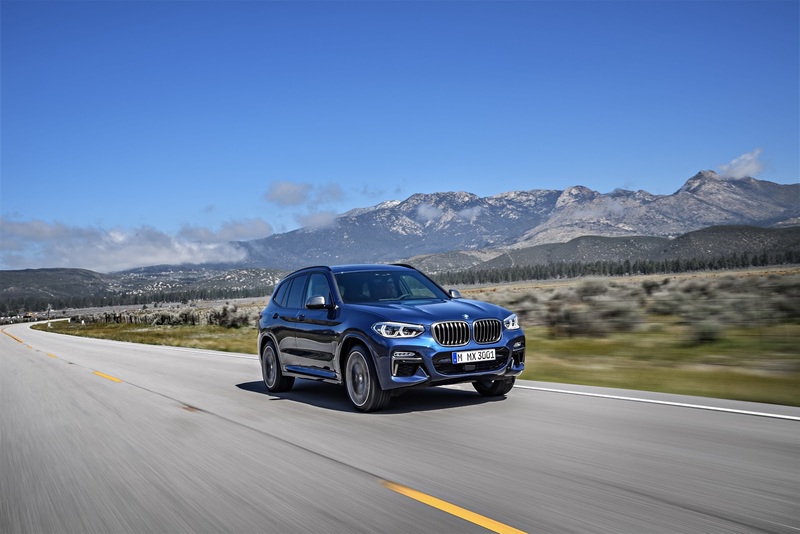 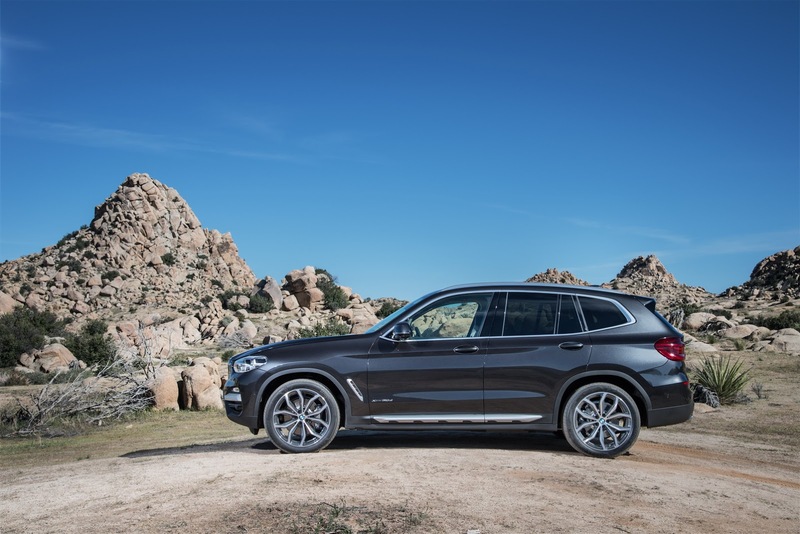 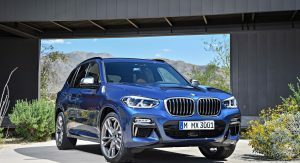 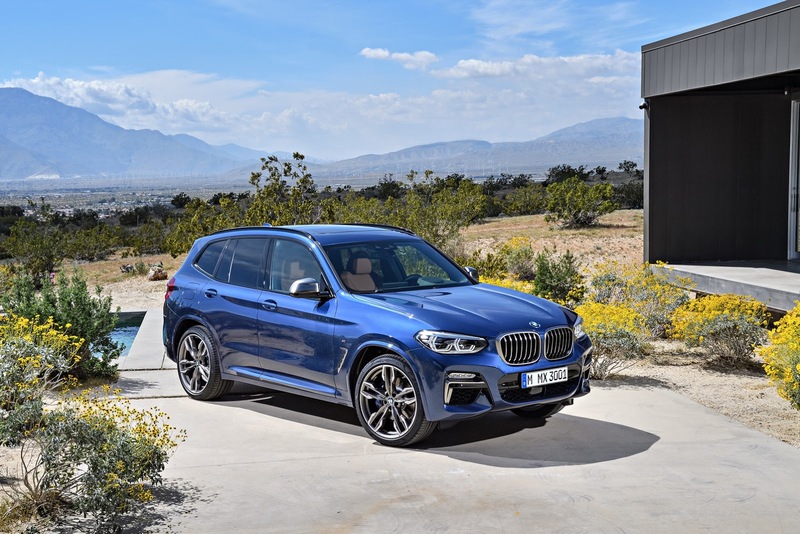 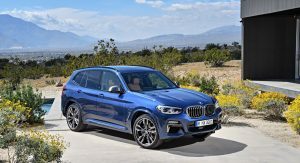 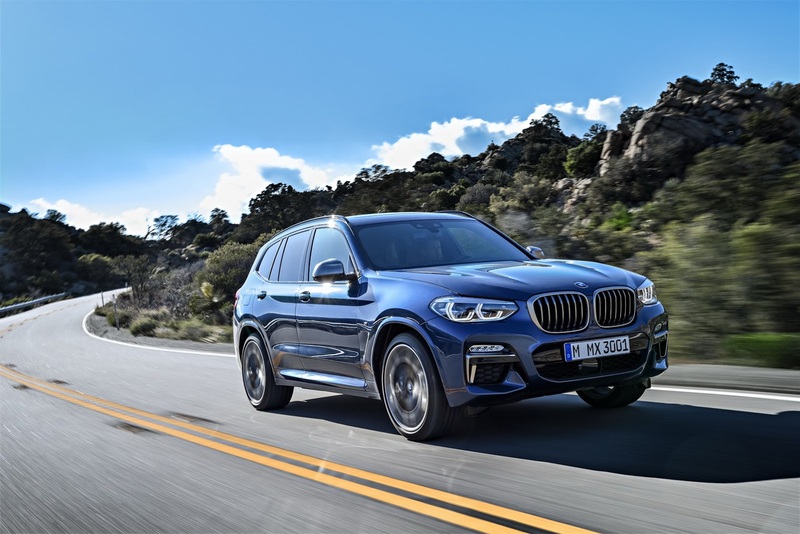 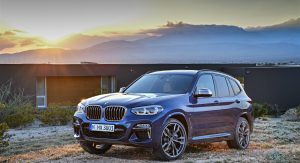 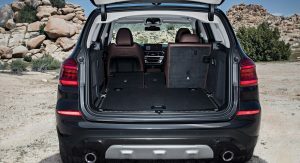 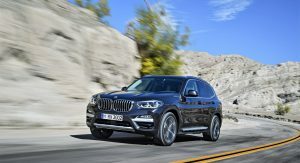 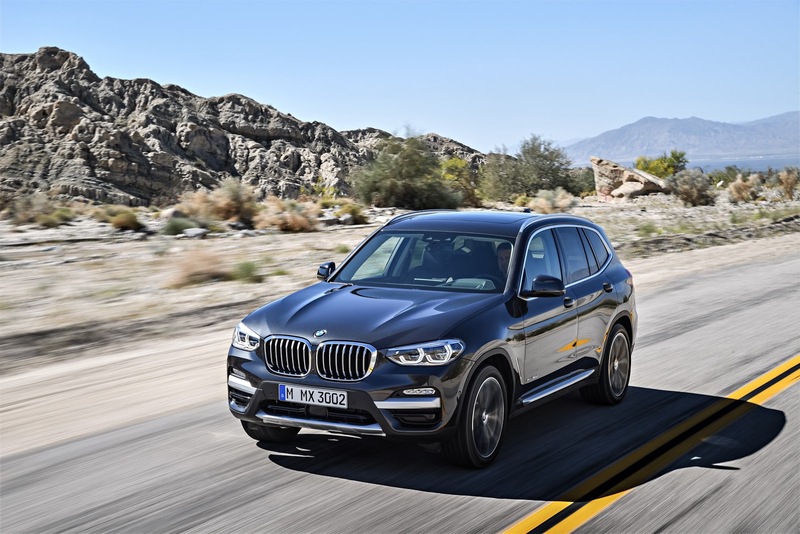 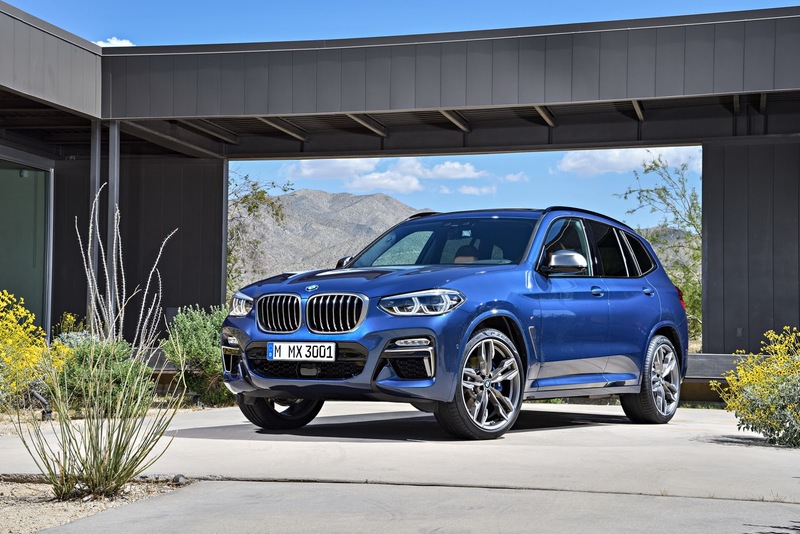 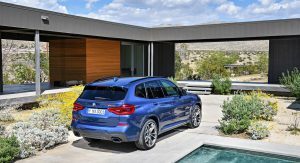 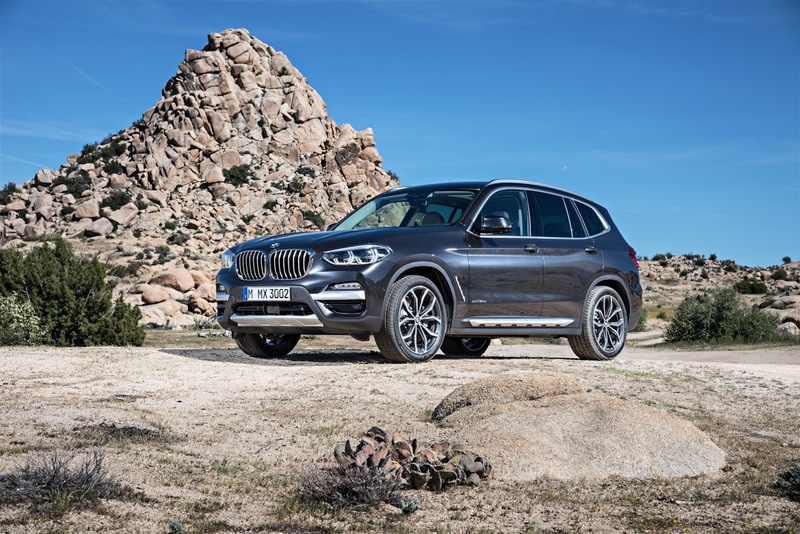 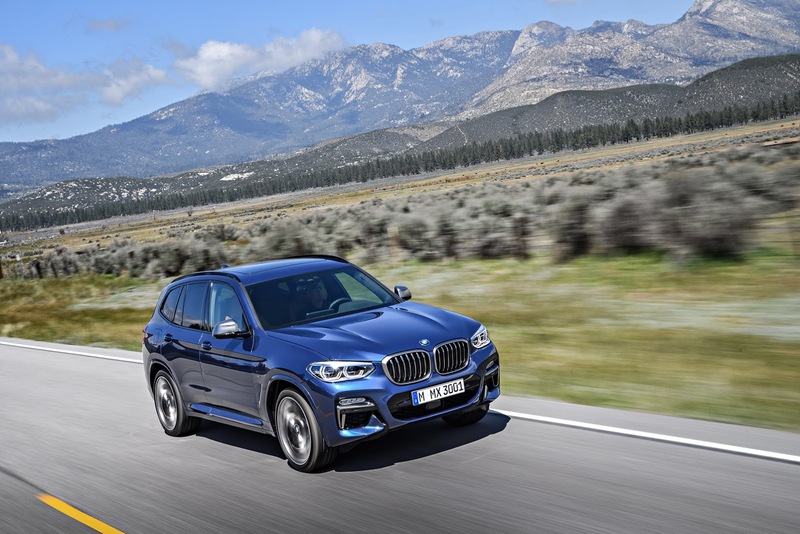 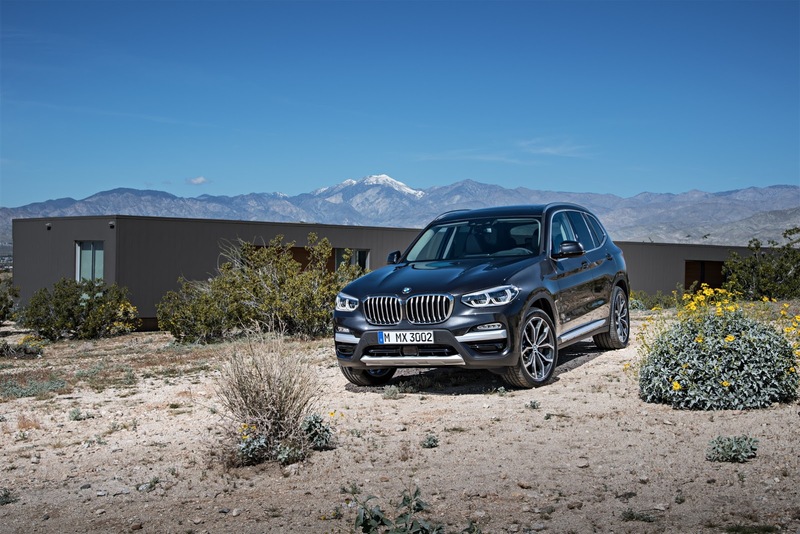 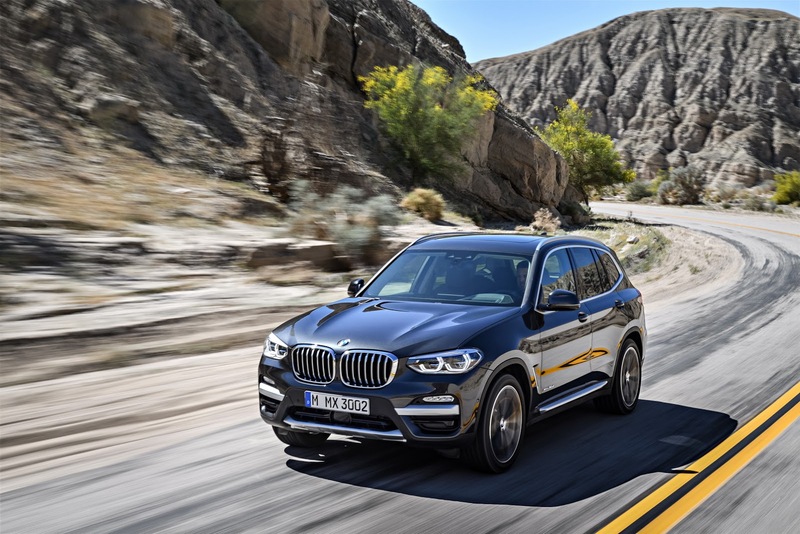 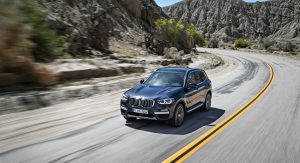 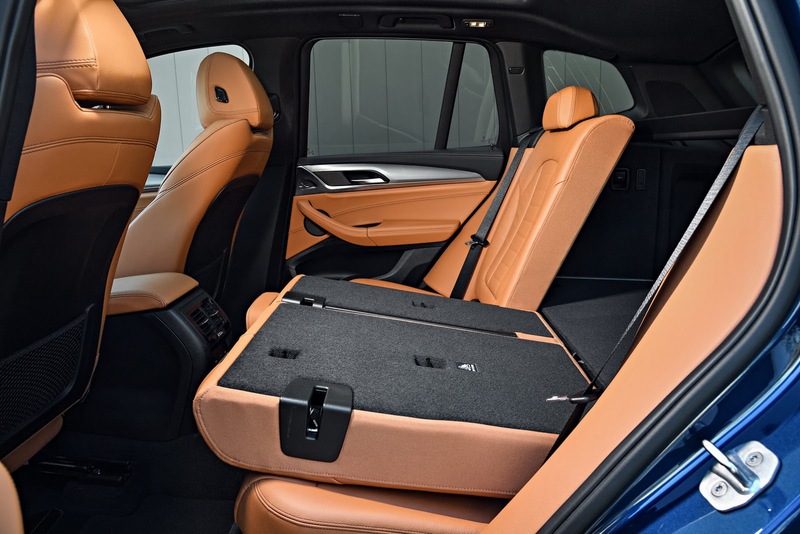 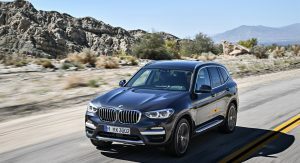 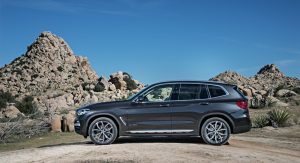 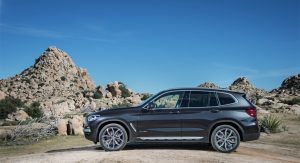 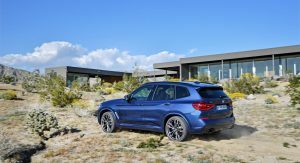 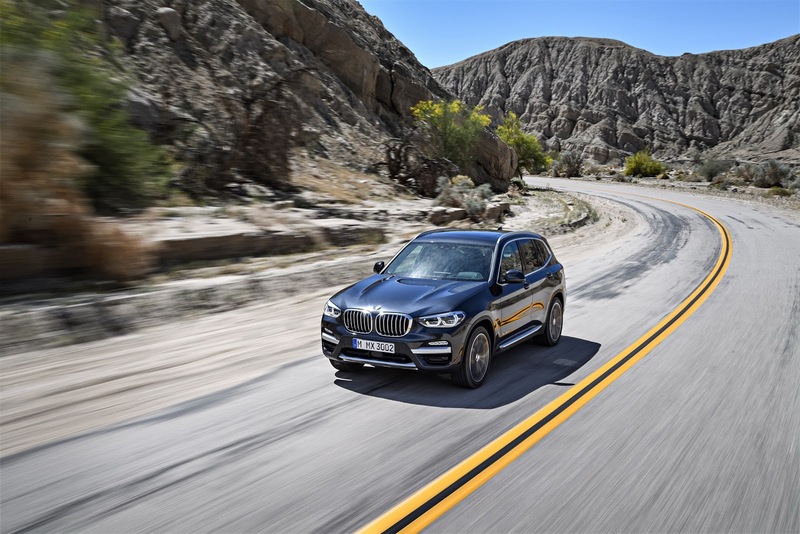 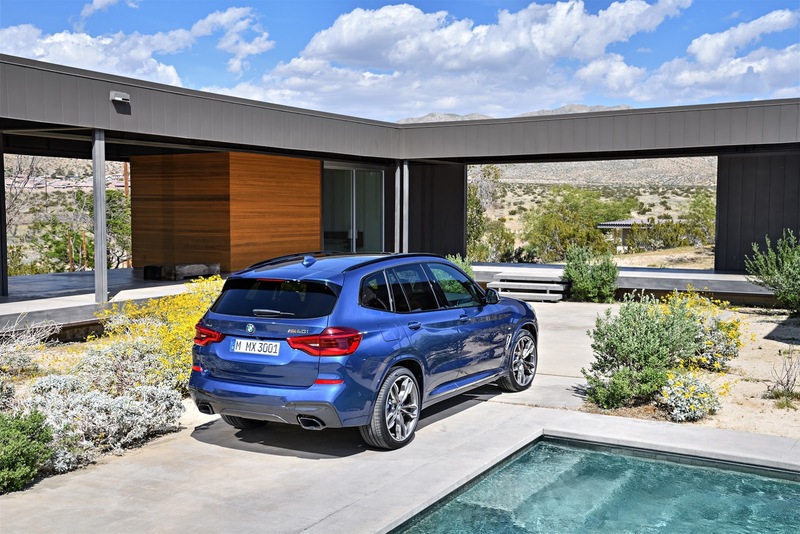 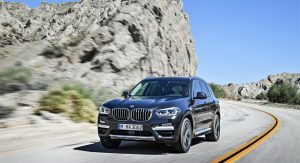 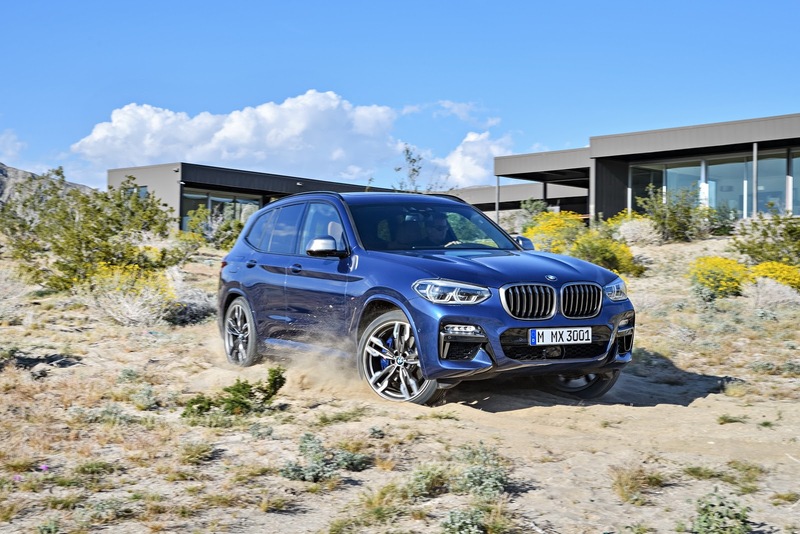 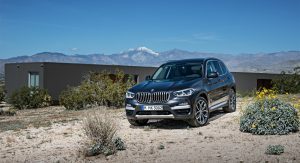 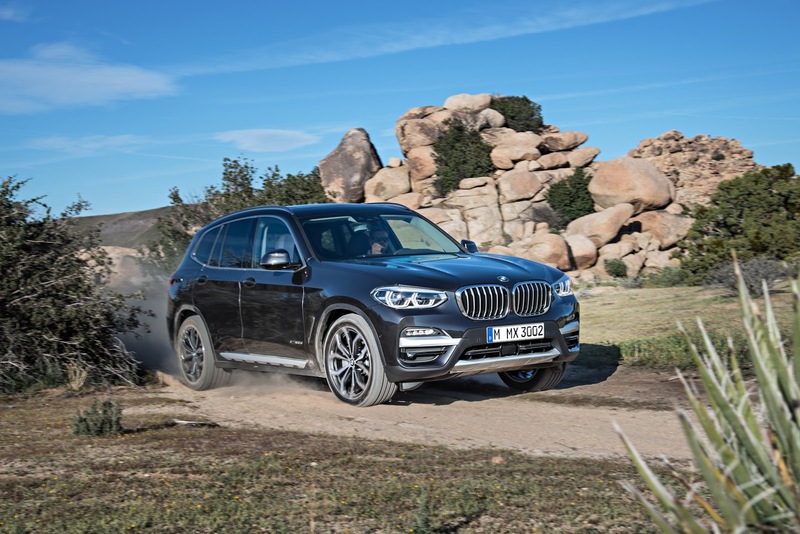 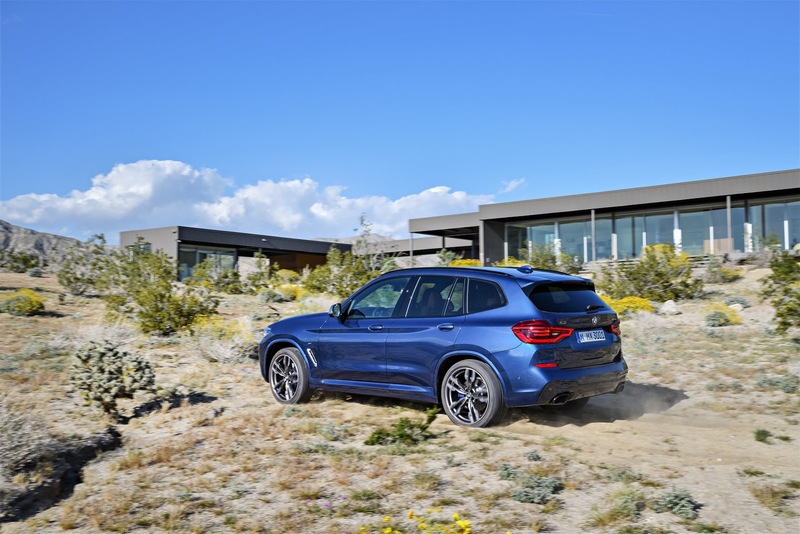 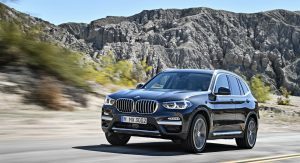 Now in its third iteration, BMW’s X3 compact SUV is bigger, more comfortable and more competent than ever when it comes to safety, performance and efficiency. 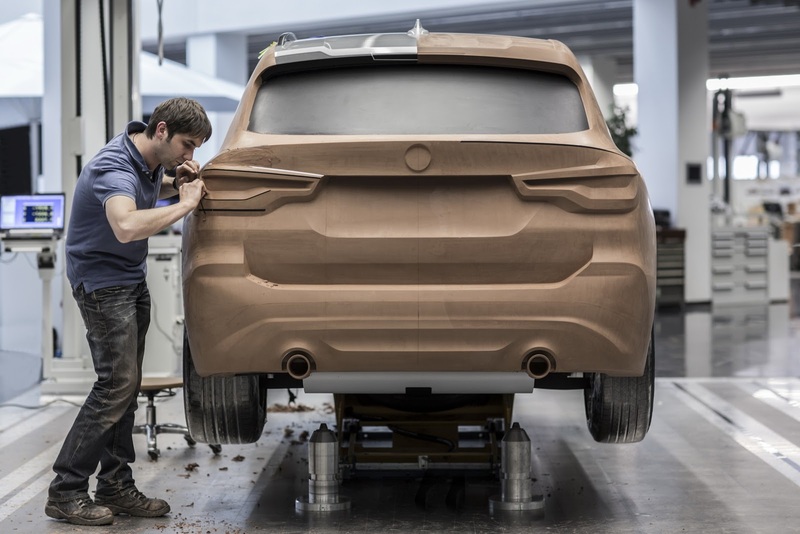 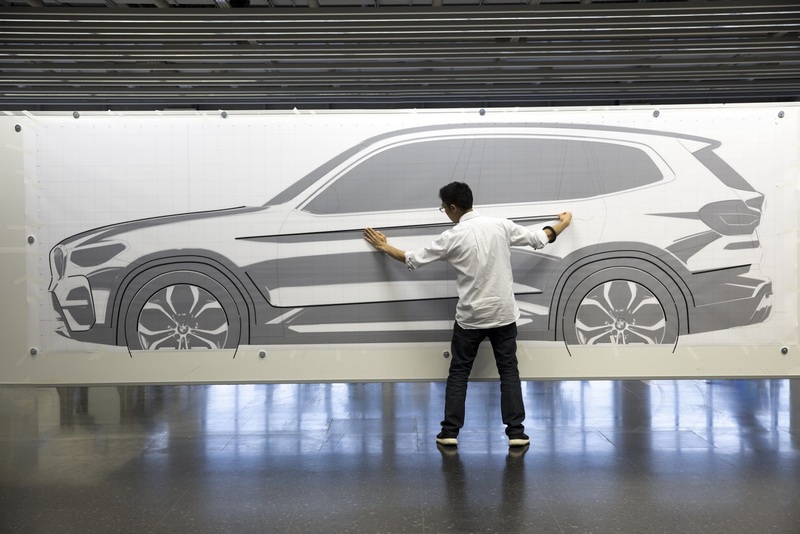 The 2018 BMW X3 was unveiled today at the Bavarian automaker’s Spartanburg plant, where it will be produced along with its X4, X5 and X6 siblings. 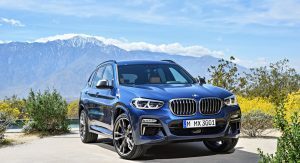 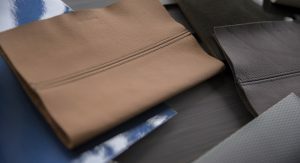 It’s also scheduled to arrive at BMW dealerships this November, with pricing to be announced closer to its market launch. 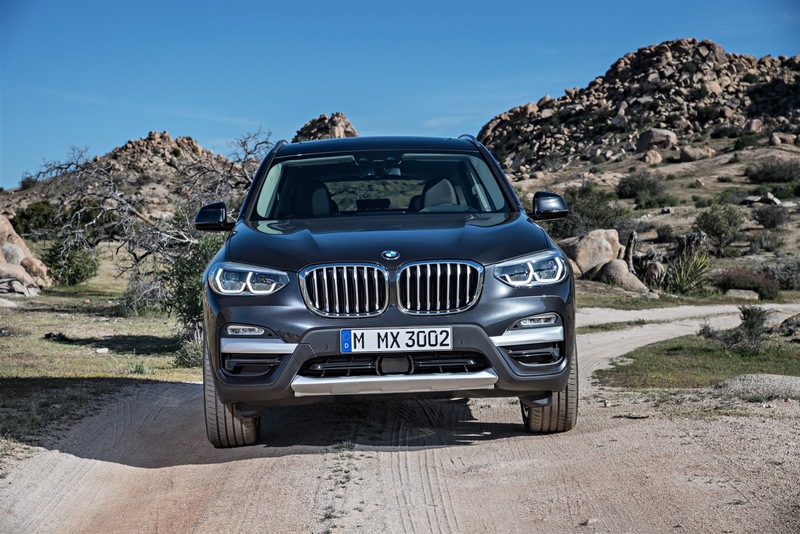 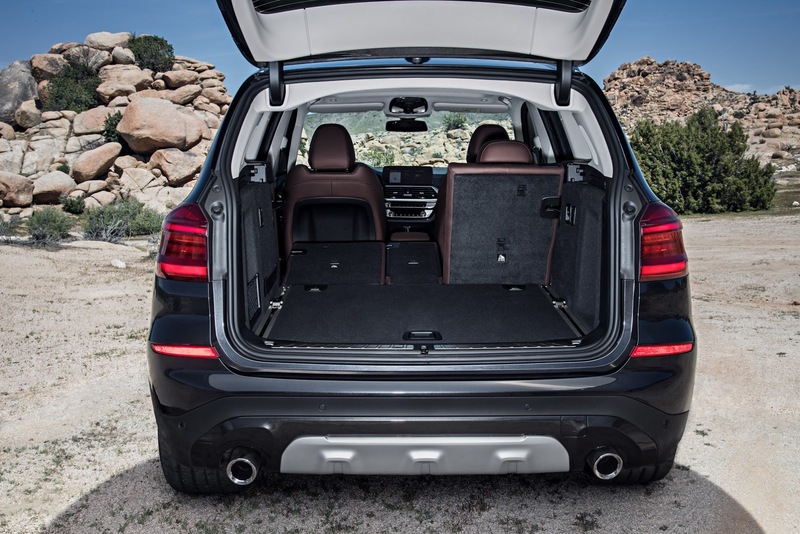 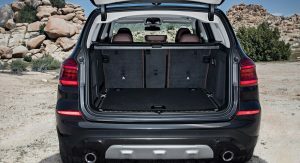 Boasting a new exterior design with distinctive looks, the all-new X3 features a larger wheelbase (by 2.2 inches / 5.5 cm) and a 50:50 weight distribution between the front and rear axle. 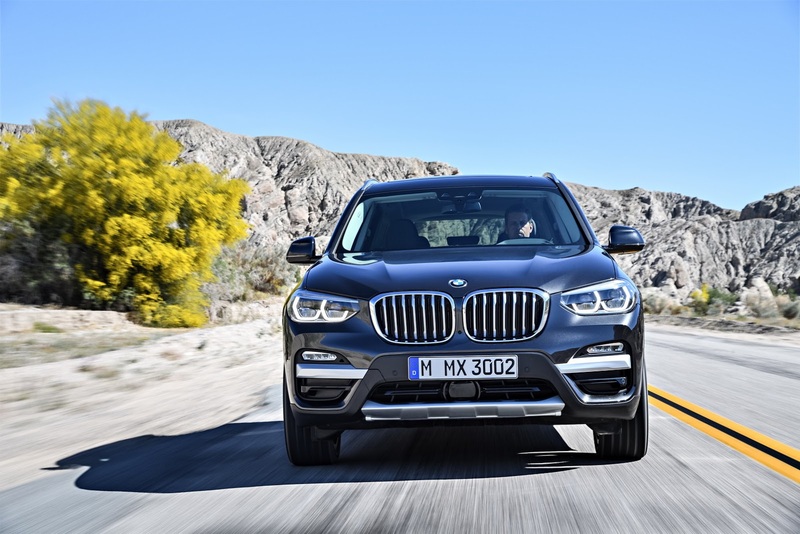 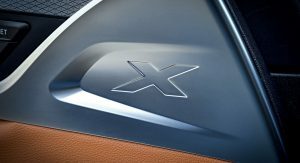 The new X3 is the first ever X model to feature a “three-dimensional” kidney grille and fog lights with a hexagonal design out front. 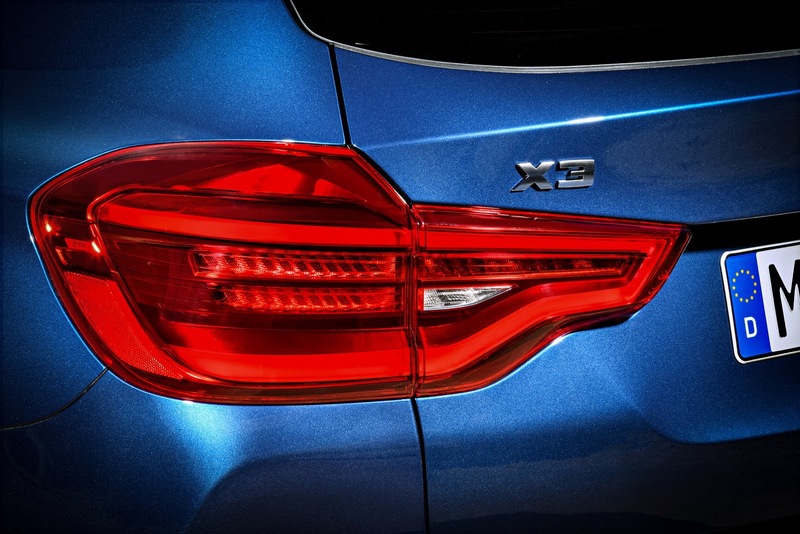 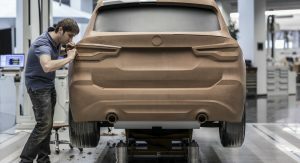 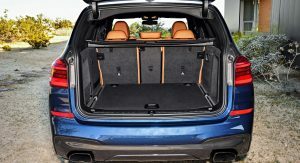 At the rear, the taillight housings also have a three-dimensional appearance, while the downward-sloping roof spoiler and twin exhaust pipes make the X3 seem more muscular, according to BMW. 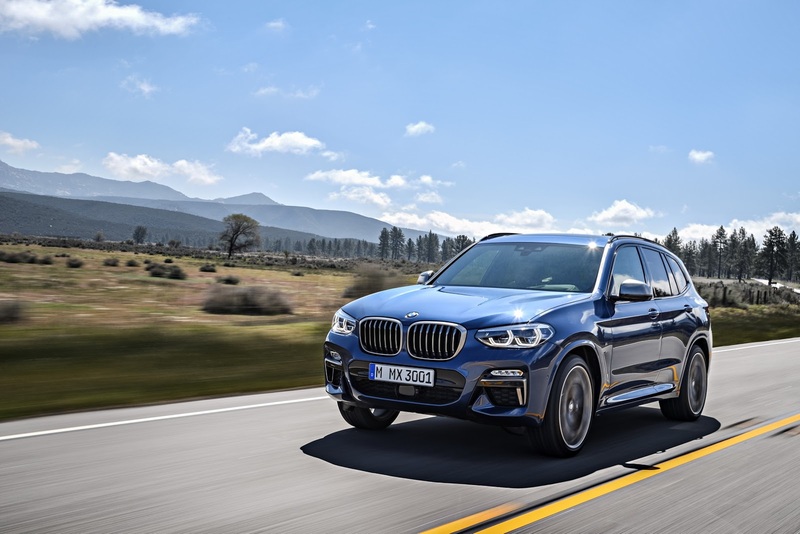 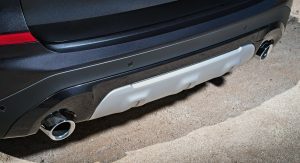 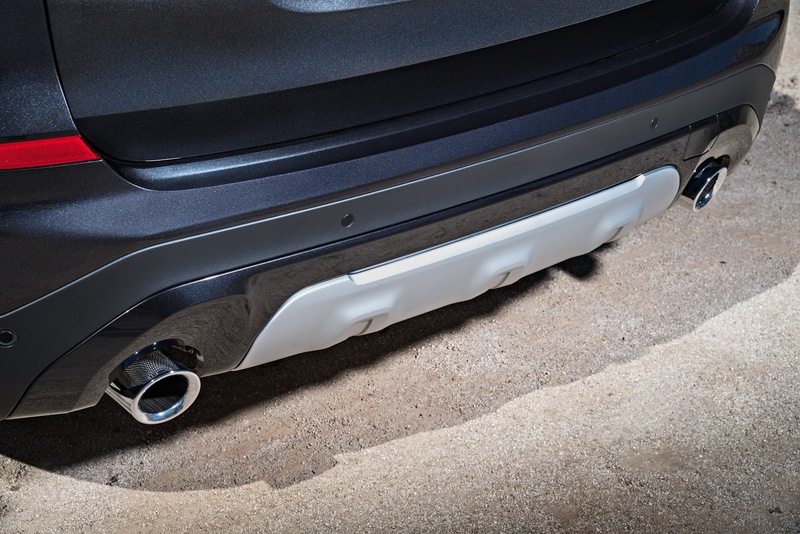 The 2018 X3 also comes with BMW’s first ever factory-installed trailer hitch for an SUV/SAV in the US, allowing customers to utilize a wide array of BMW Accessories such as tongues, drop tongues, towing balls, plus several varieties of bike racks. 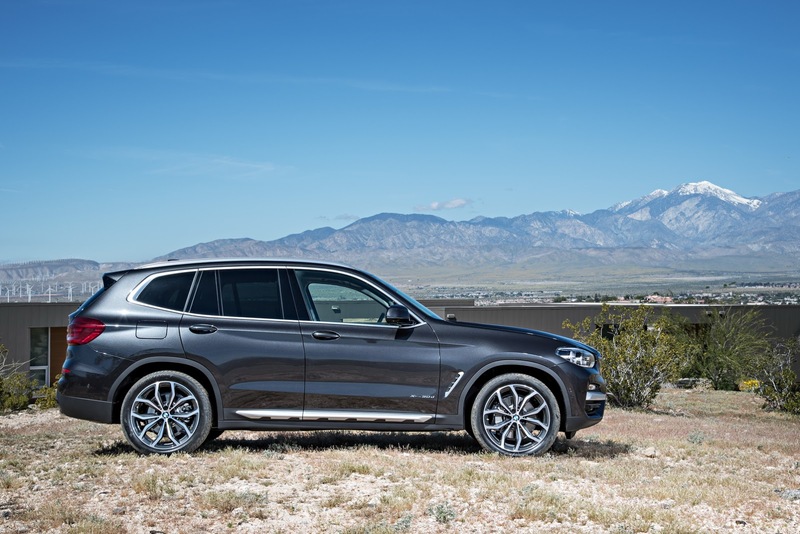 In standard xLine design form, the 2018 X3 stands out thanks to several trim elements covered in Satin aluminum and Silver matte, plus standard 18″ Y-spoke wheels with all-season run flat tires (19″ V-Spoke wheels available as an option). 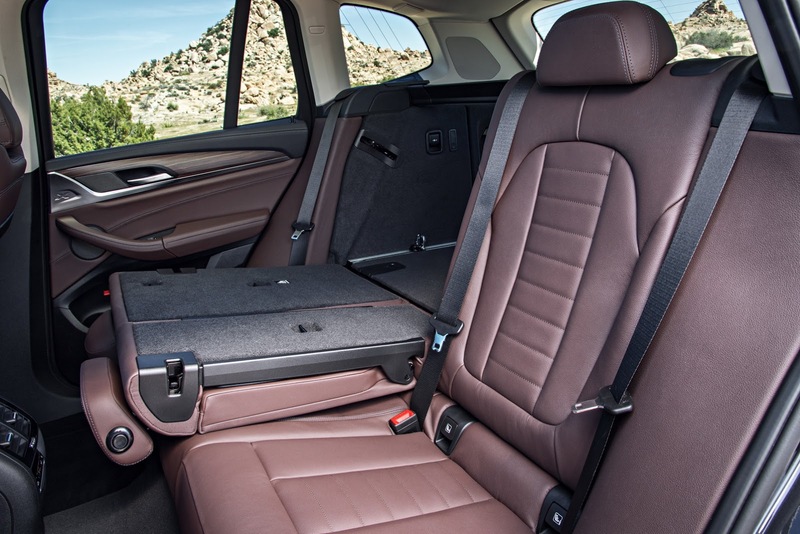 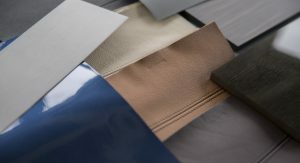 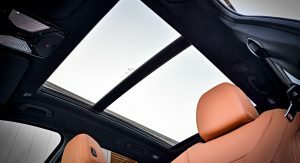 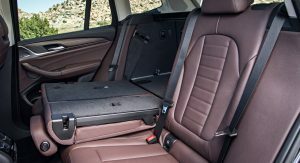 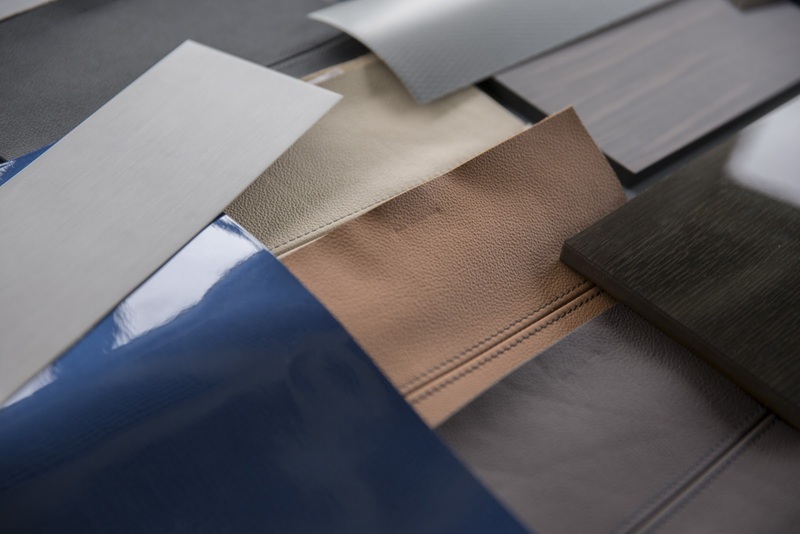 Inside, the driver and the front passenger can enjoy the Anthracite headliner, as well as the standard Sport Seats with power adjustable side bolsters. 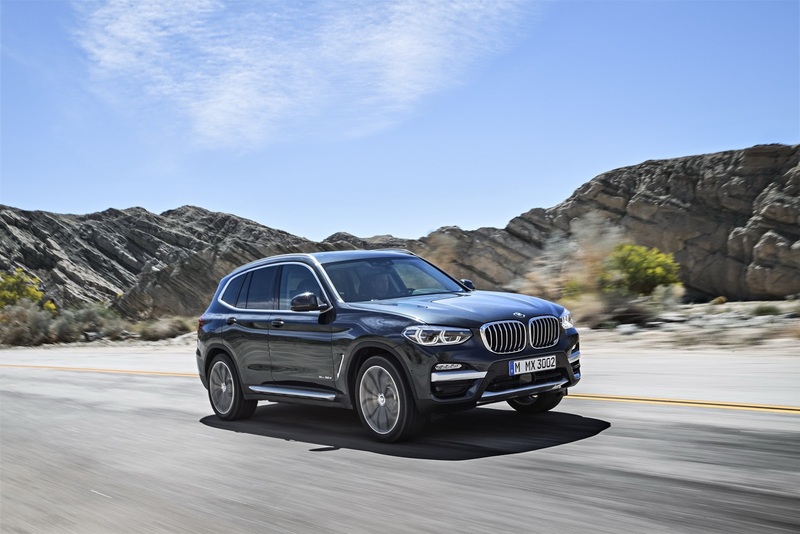 The optional Luxury Package, available for the first time in the X3 model range, adds chrome kidney grille bars and two-tone front and rear bumper trim finishers on the exterior, as well as a SensaTec upholstered dashboard inside. 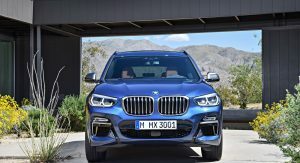 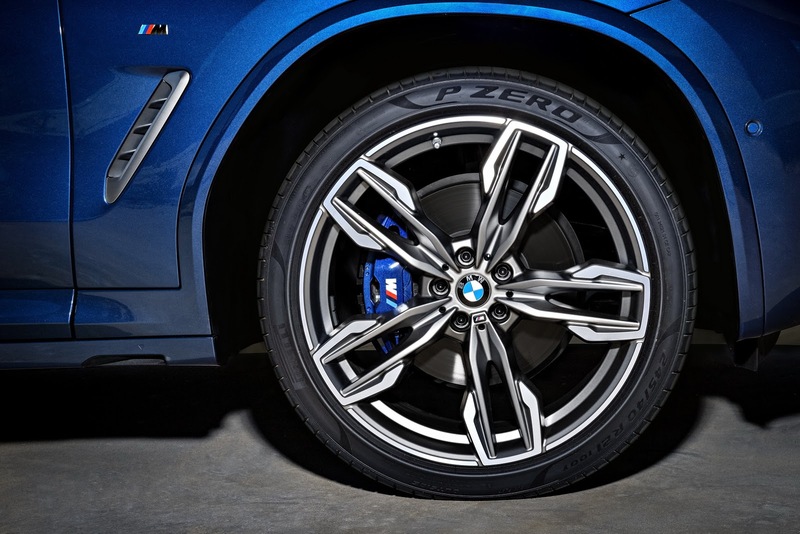 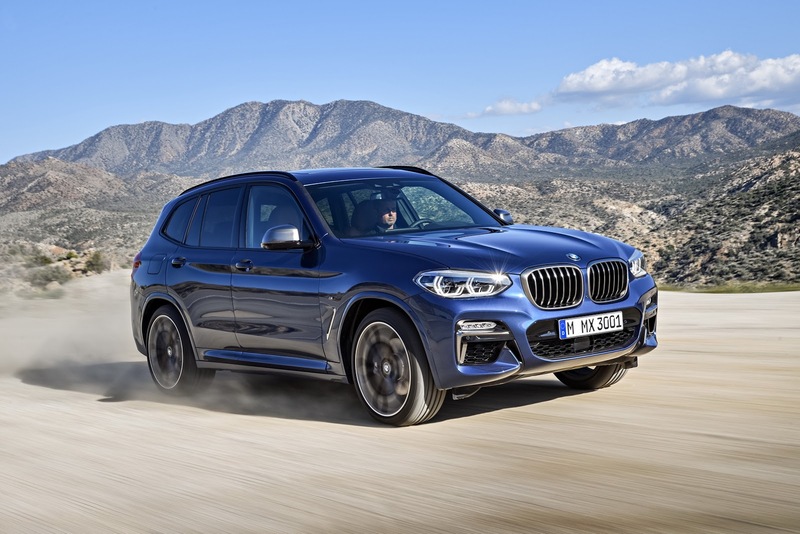 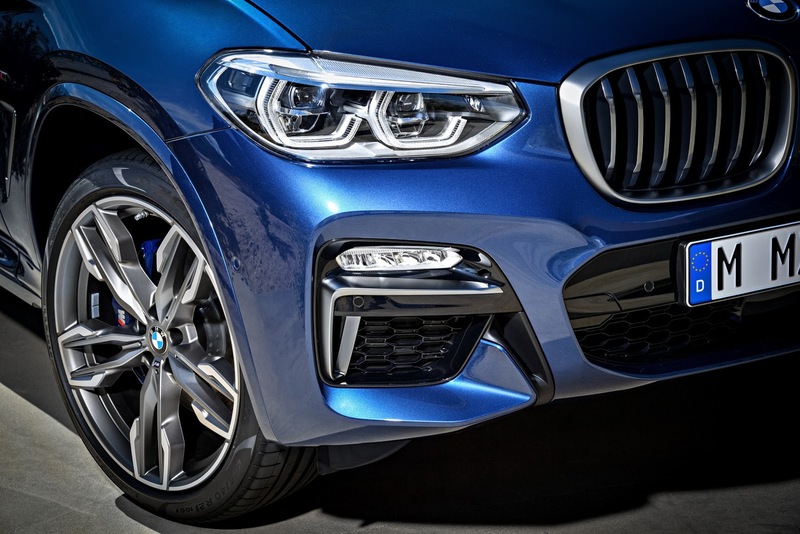 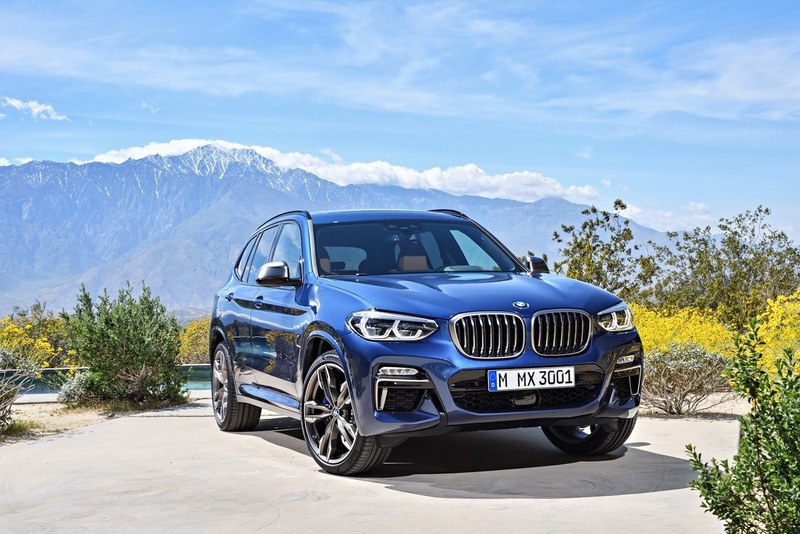 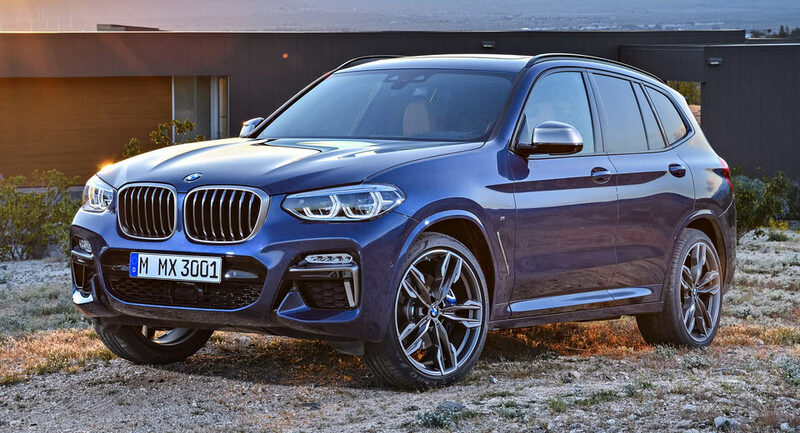 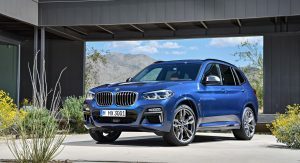 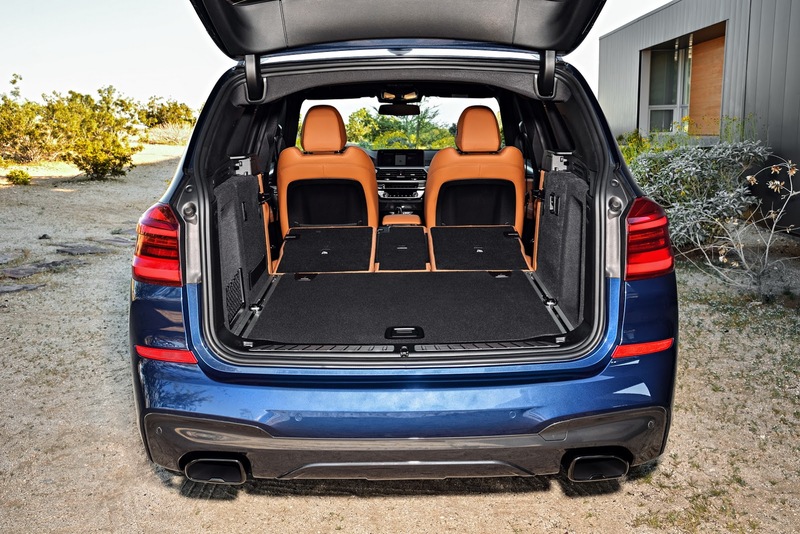 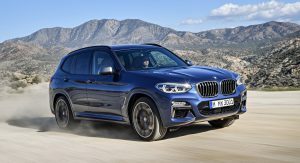 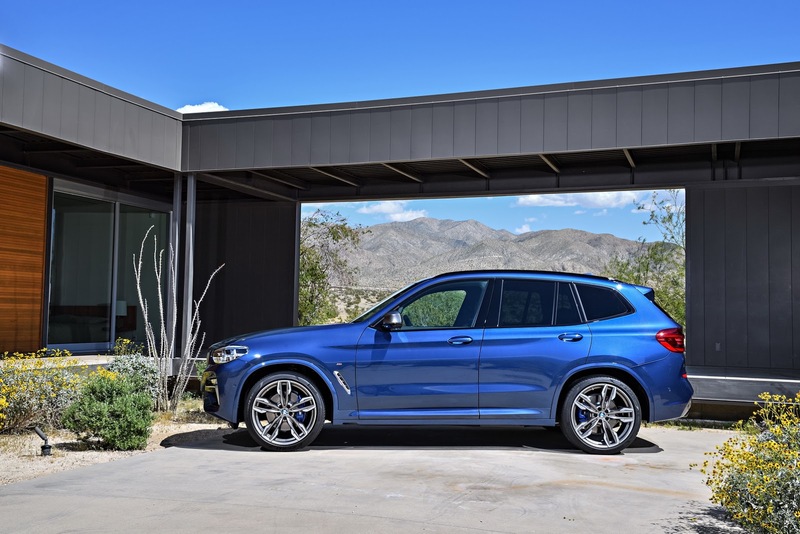 Customers opting for the all-new BMW X3 with the M Sport Package will get the M Aerodynamics kit (front apron with larger air intakes, side skirt trim and a diffuser-style rear apron), plus the Shadowline exterior trim and 19″ M double-spoke wheels (20″ alloys available as options). 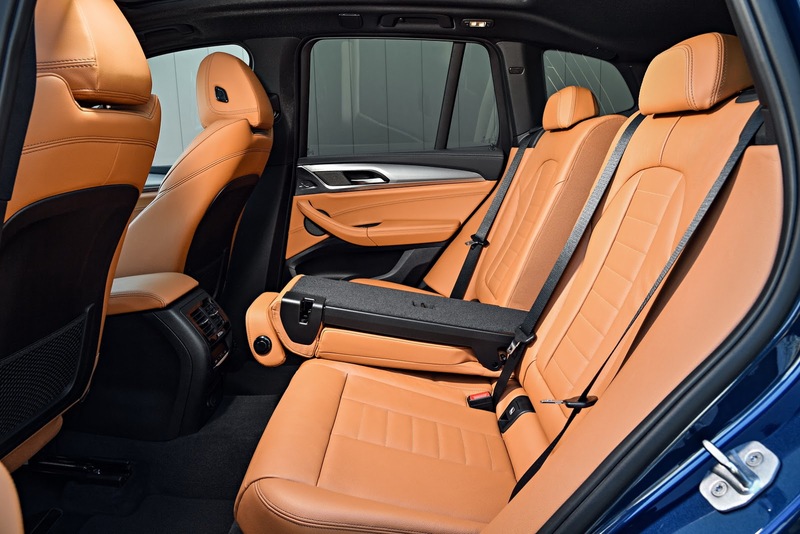 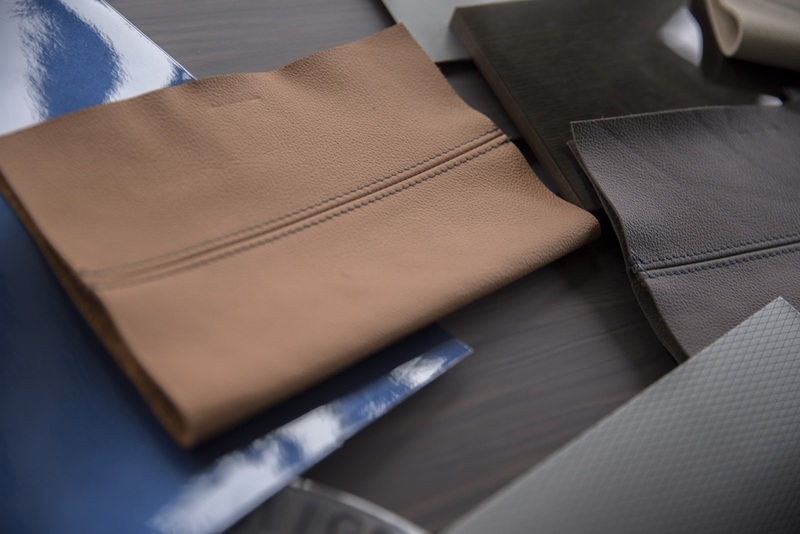 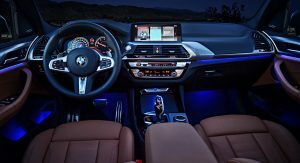 Inside, there’s the new M Sport leather steering wheel, M door sill finishers and a SensaTec upholstered dashboard, just like with the Luxury Package. 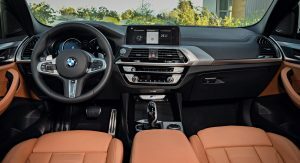 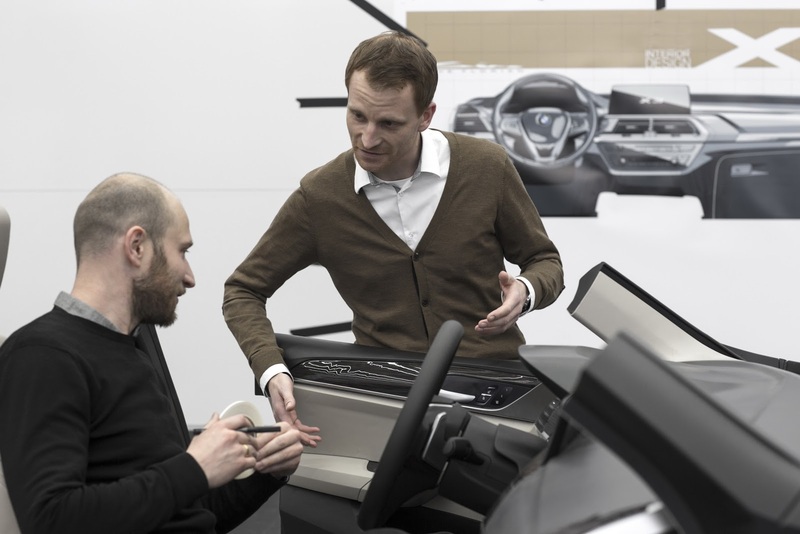 Speaking of the interior, the new X3 has a driver-focused cockpit layout, with hexagonal forms and sloping edges playing a central role, just as they do in the exterior design. 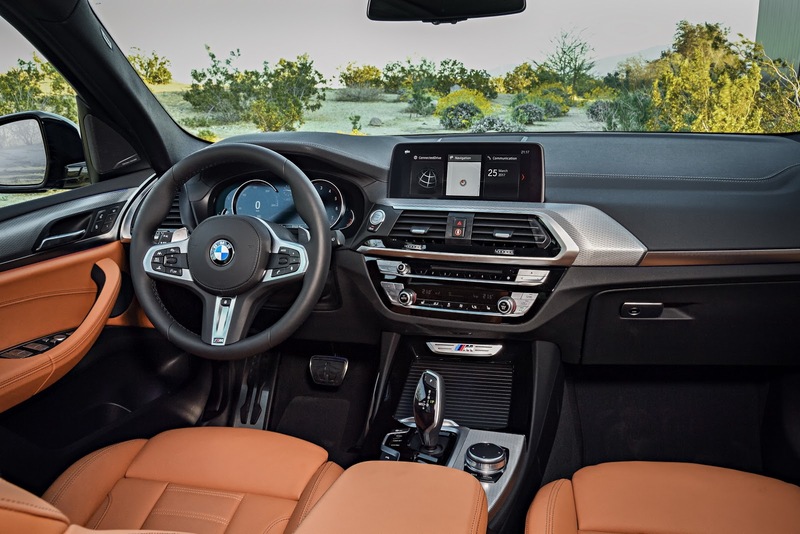 Among its new comfort enhancing features, you’ll find the 3-zone automatic climate control, front ventilated seats, a longer panoramic glass moon roof, as well as the 40:20:40 split/folding rear seat backrests which can be adjusted individually and through various stages. 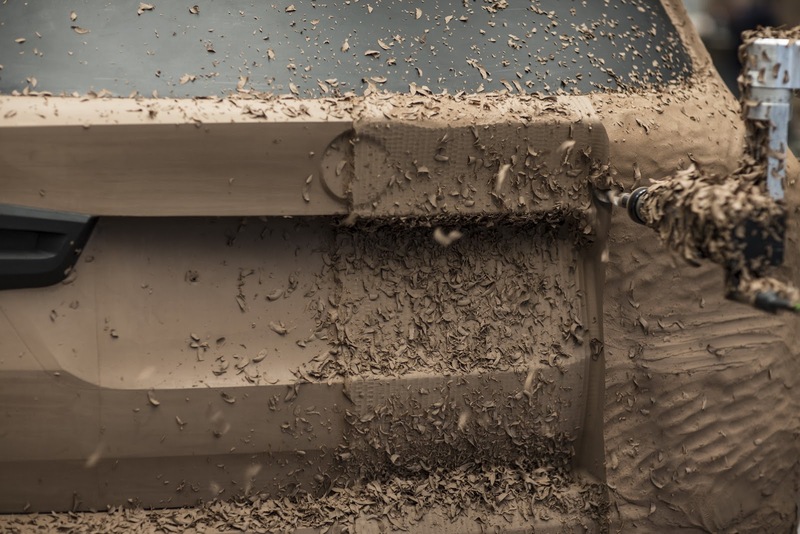 This system allows the backrests to be released remotely from the load compartment, thus expanding the standard load capacity from 28.7 cu-ft (0.81 m3) to 62.7 cu-ft (1.77 m3). 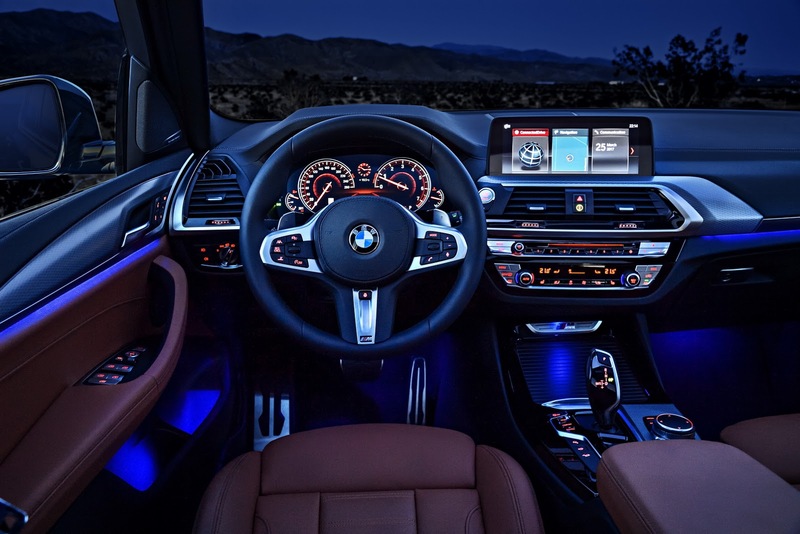 Another interesting piece of tech is the contour lighting found above the trim strip in the instrument panel, available with the Extended Ambient Lighting package. 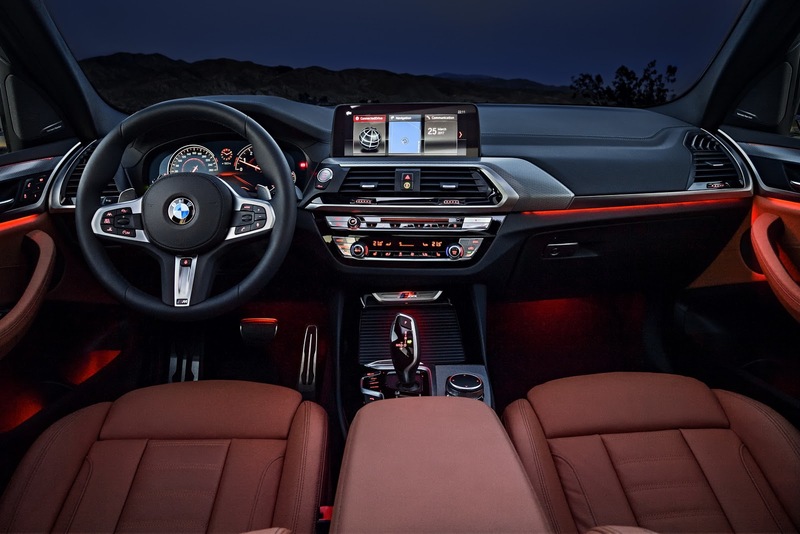 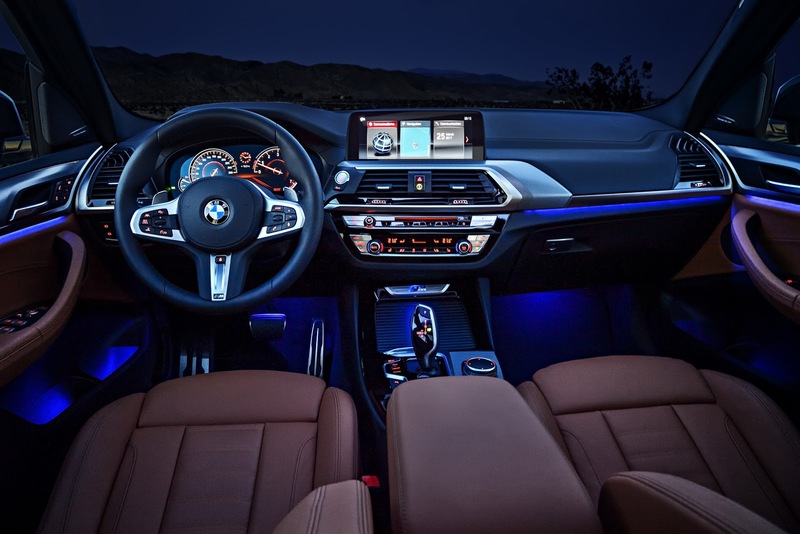 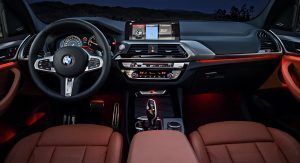 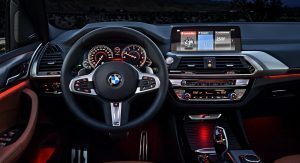 BMW says that at night, the iDrive display appears to be floating above the instrument panel thanks to the soft stream of light, available in six color tones. 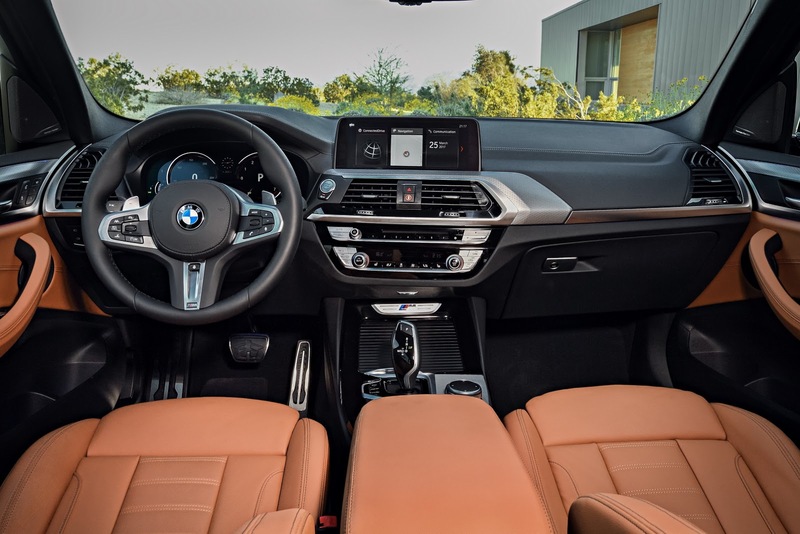 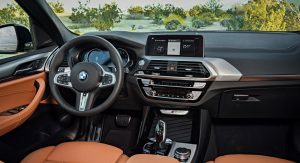 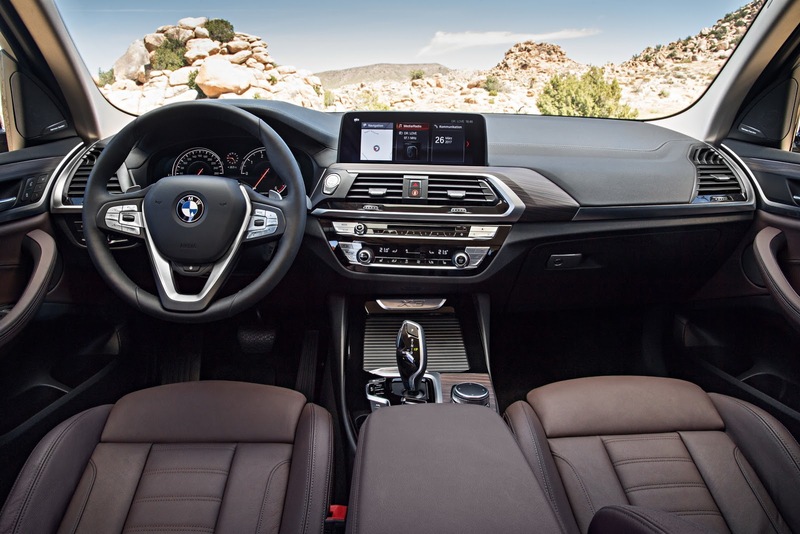 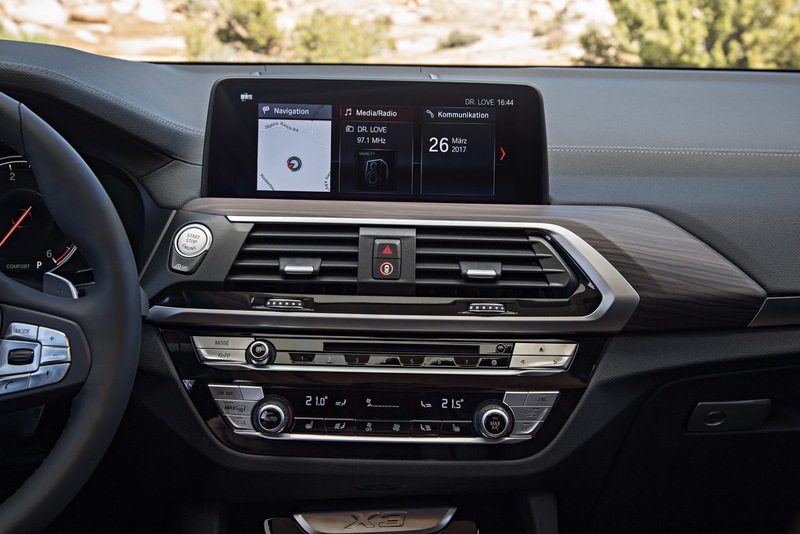 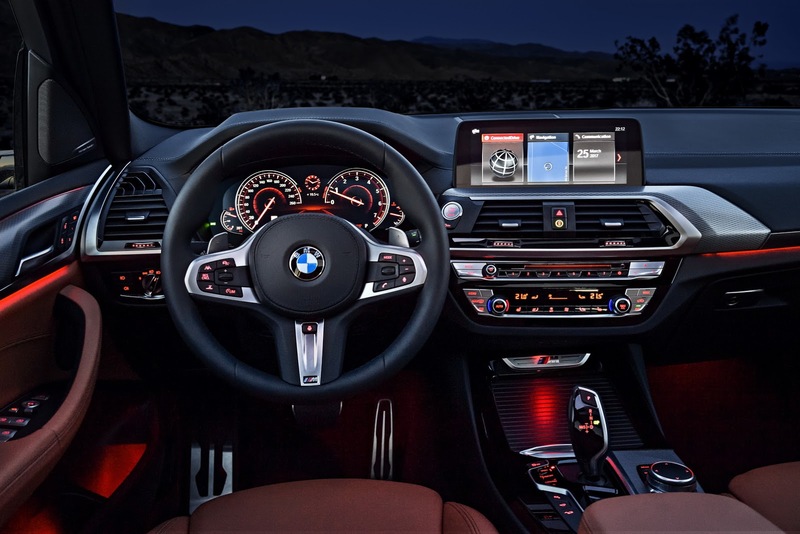 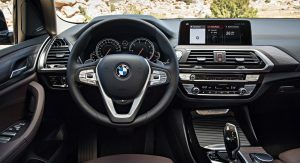 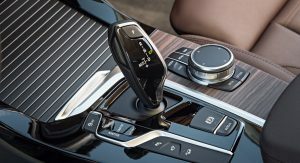 When it comes to new technology, the 2018 X3 boasts an optional 10.25″ touchscreen display, Gesture Control (like on the 7-Series), cloud-based Intelligent Voice Control and digital services available through the BMW Connected app. 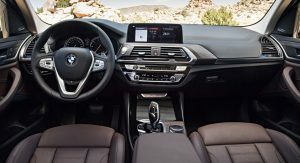 Now, you can connect your new BMW X3 to smart wearables like the Apple Watch or Samsung Gear (S2 and S3). 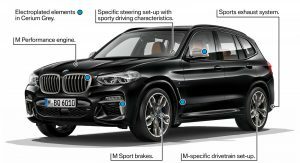 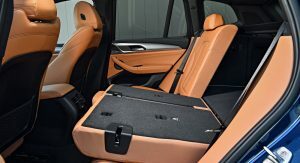 With safety in mind, BMW have added systems like Active Protection as standard, which detects potential accident situations as they arise. 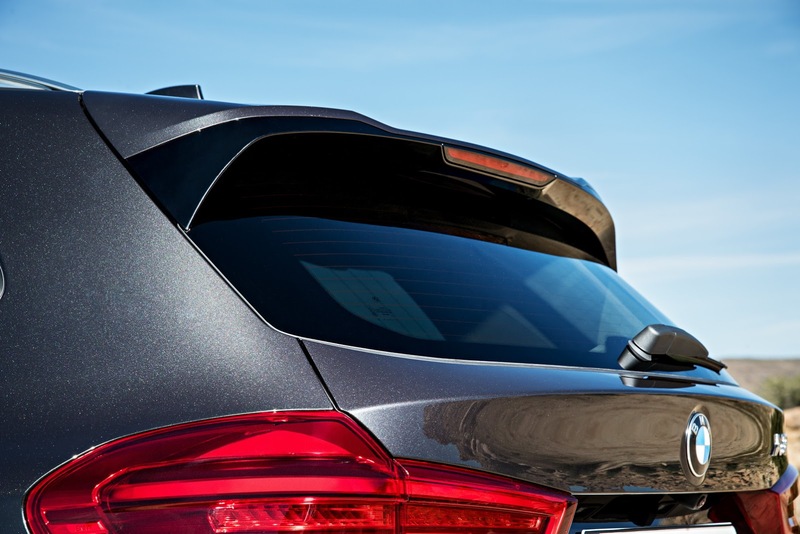 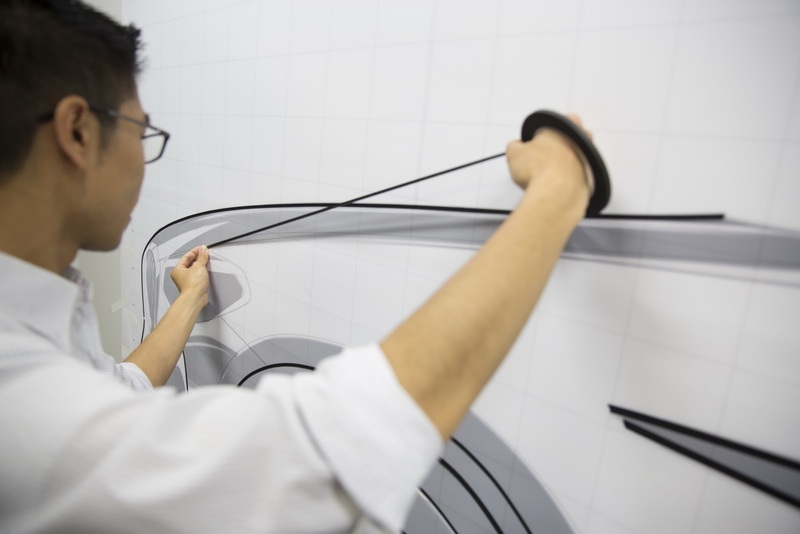 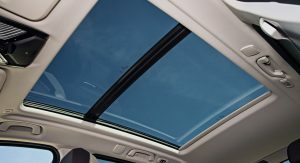 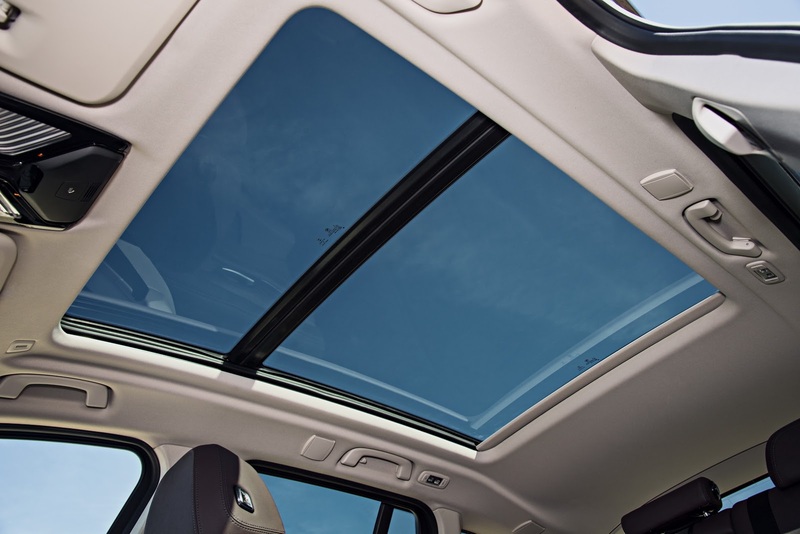 If a collision risk is detected, the system then activates multiple occupant protection measures such as belt tensioners, closing windows and moon roof. 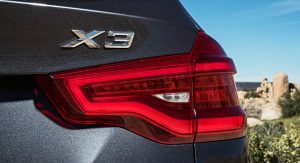 At the same time, the Frontal Collision Warning system will also prepare the X3 for a possible impact from behind even if the initial risk assessment suggests that a collision with preceding vehicles is more likely. 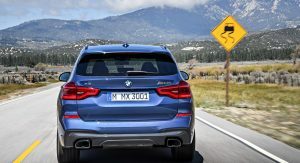 Active safety systems include the latest generation Active Cruise Control with Stop & Go, Active Blind Spot Protection, Lane Departure Warning, Daytime Pedestrian Protection, Frontal Collision Warning with City Collision Mitigation, Cross Traffic Alert rear, and Speed Limit Info (Navigation system required). 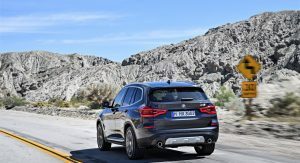 The optional Driving Assistant Plus package adds the Active Lane Keeping Assistant with Side Collision Avoidance, Traffic Jam Assistant, Evasion Aid and Cross Traffic Alert front and rear. 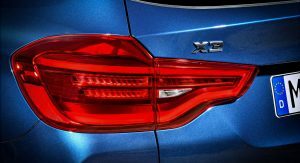 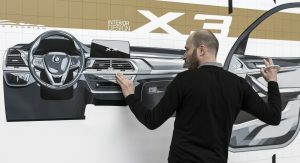 BMW also boasts about the new X3’s optional Head-Up Display, which is 75% larger and said to be unrivaled in its segment in terms of graphics, resolution and display options. 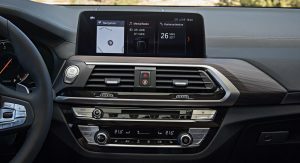 Another unique feature on the new X3 is its Remote 3D View function, which can beam a 360 degree, 3D view of the car’s immediate vicinity directly to a smartphone. 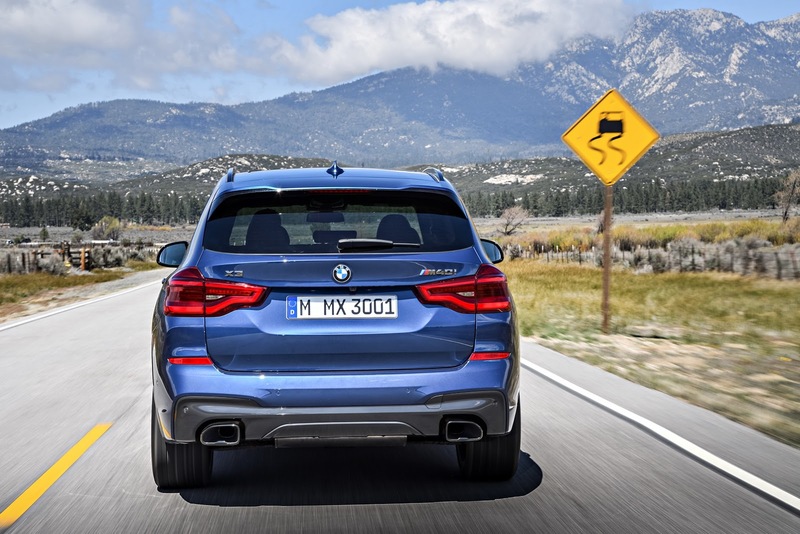 On the road, the rear bias of the X3’s xDrive all-wheel drive system has been increased. 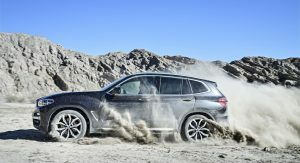 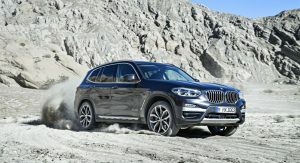 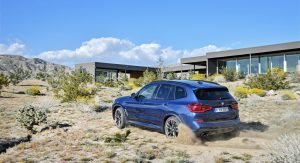 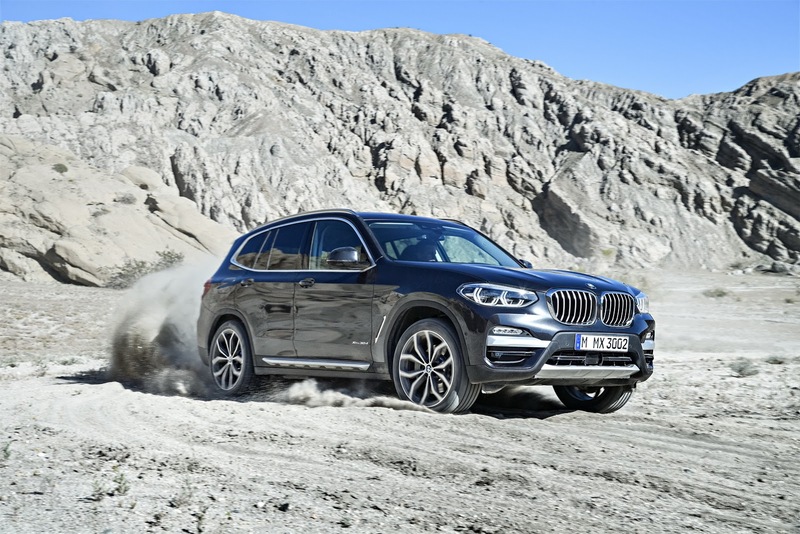 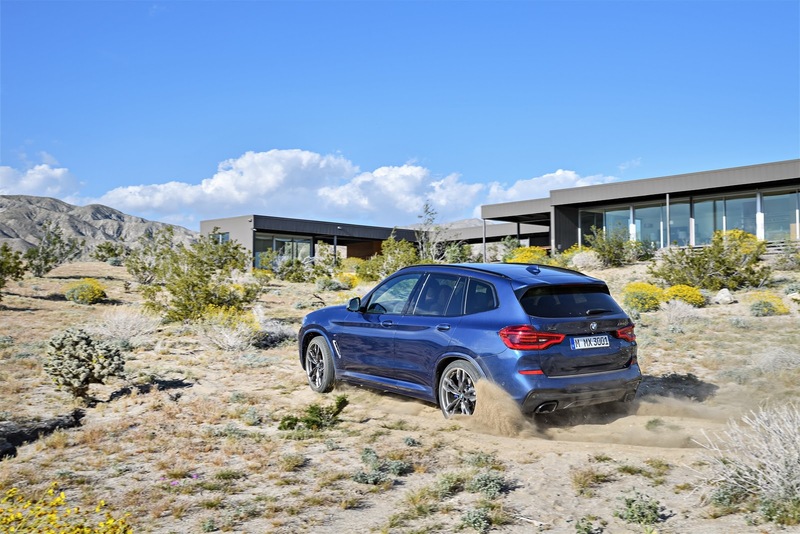 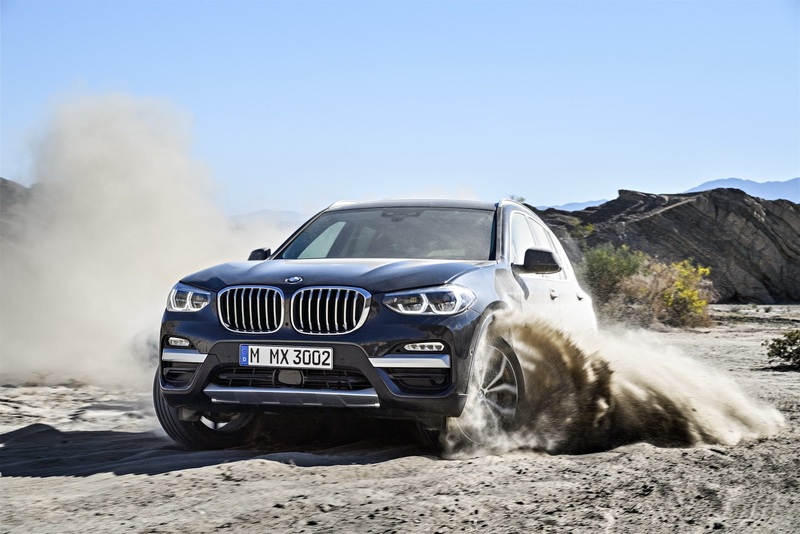 Also, with 8″ (20 cm) of ground clearance, BMW’s newest X-model can tackle just about any terrain, from gravel or sand, to deep snow. 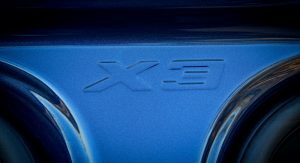 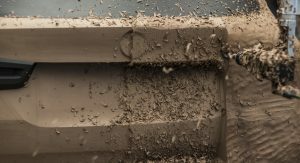 Then there’s the fording depth of 19.6 inches (49.8 cm), which allows the new X3 to perform water crossings unhindered, as long as the water isn’t too deep, of course. 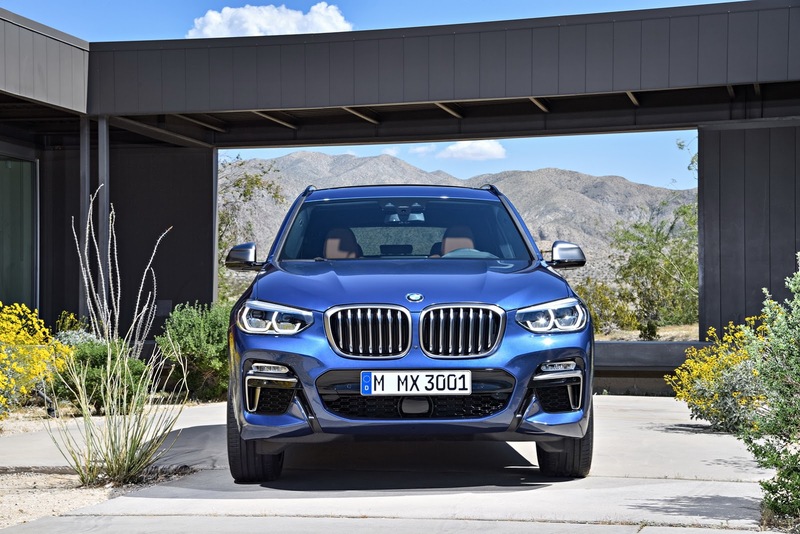 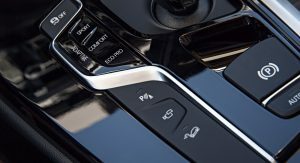 Buyers can also choose between multiple powerunit configurations, such as the xDrive20d, xDrive 30i, xDrive 30d and the new X3 M40i flagship. 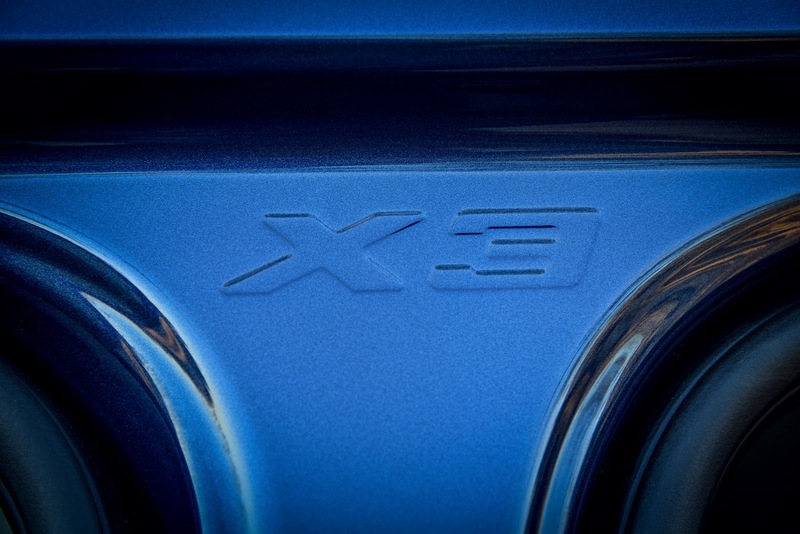 The xDrive30i version for example has an output of 248 horses, 8 in total more than the current xDrive 28i model. 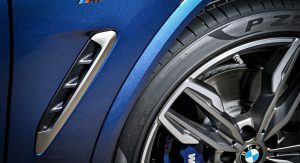 It can also get from 0 to 60 mph (96 km/h ) in 6 seconds flat and top out at 130 mph. 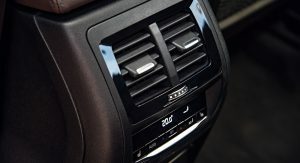 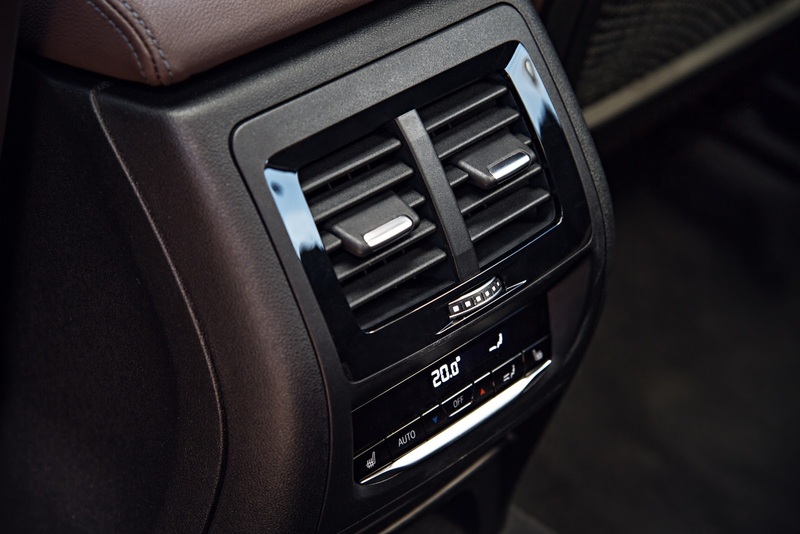 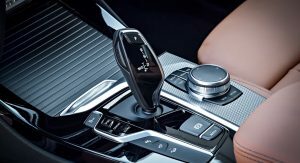 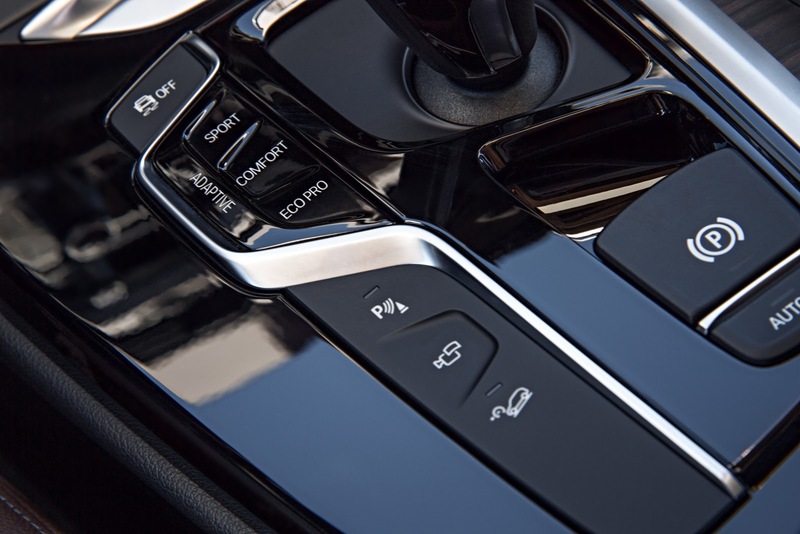 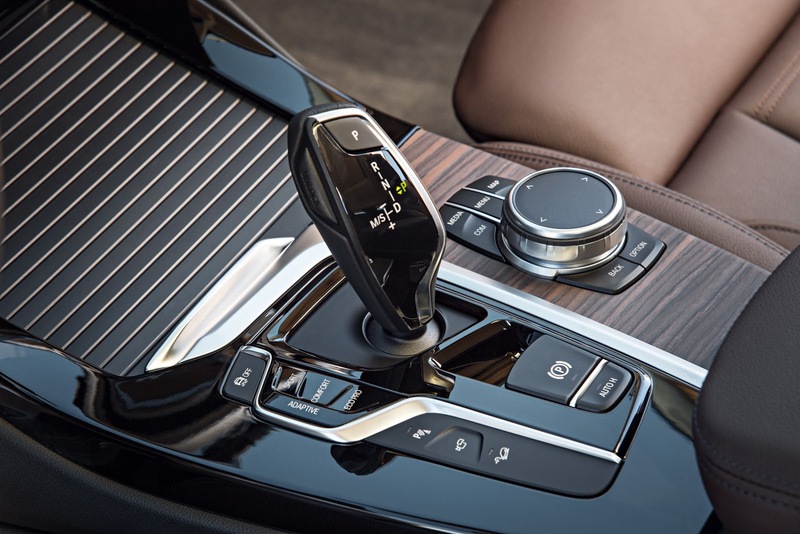 An 8-speed Steptronic Sport automatic transmission is standard on all models. 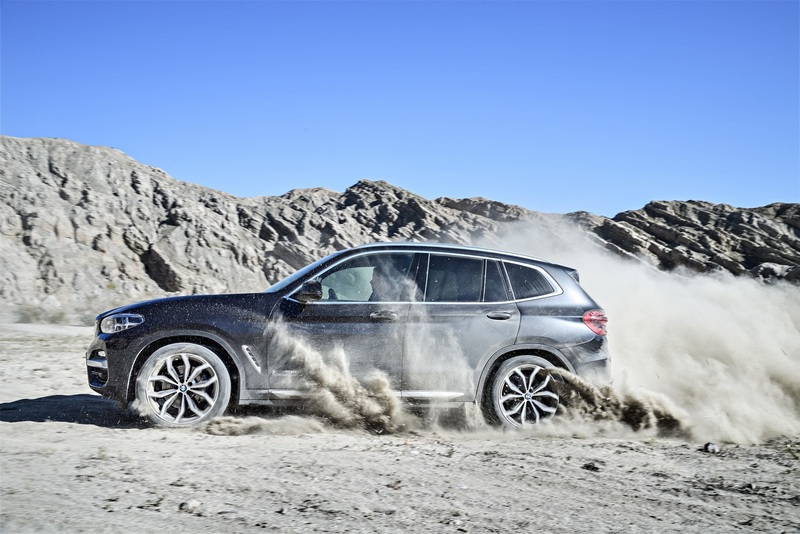 As for xDrive20d and xDrive30d diesel models, they feature 190 PS with 400 Nm and 265 PS with 620 Nm of torque respectively, where the 20d will hit 100 km/h (62 mph) in 8 seconds and the 30d in 5.8 seconds. 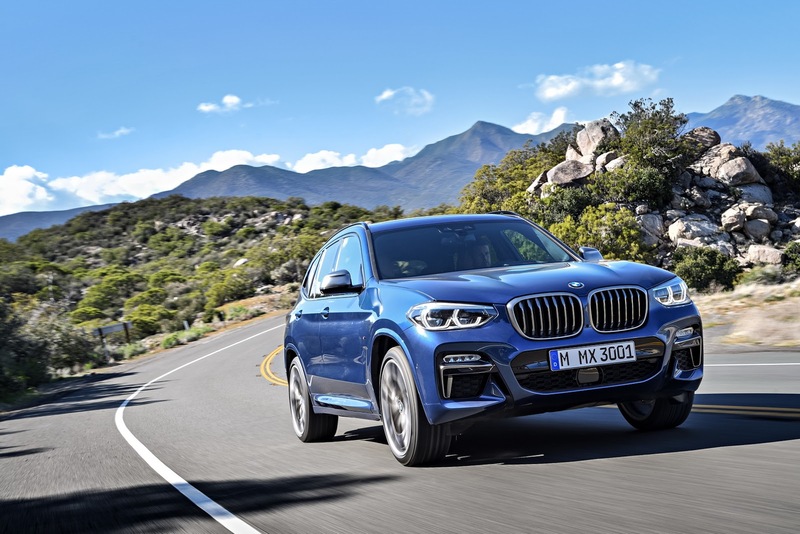 In terms of fuel consumption, the xDrive20d (142-132 g/km CO2) will average a combined 5.4-5.0 liters per 100km, whereas the more powerful model (158-149 g/km CO2) makes due with 6.0-5.7 l/100 km. 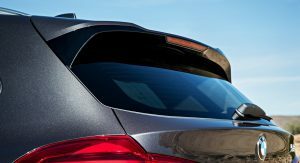 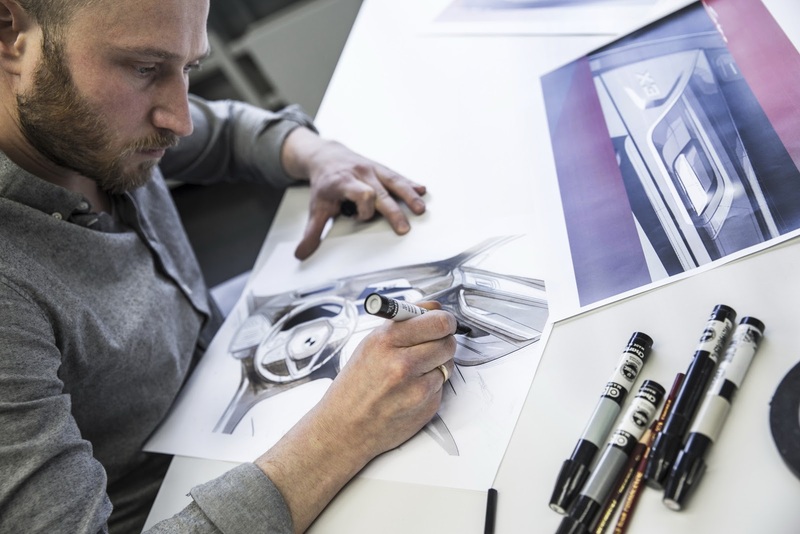 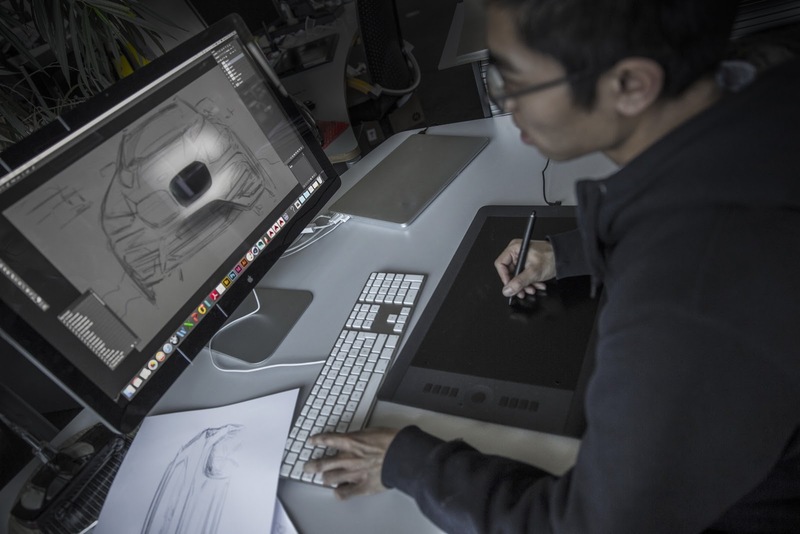 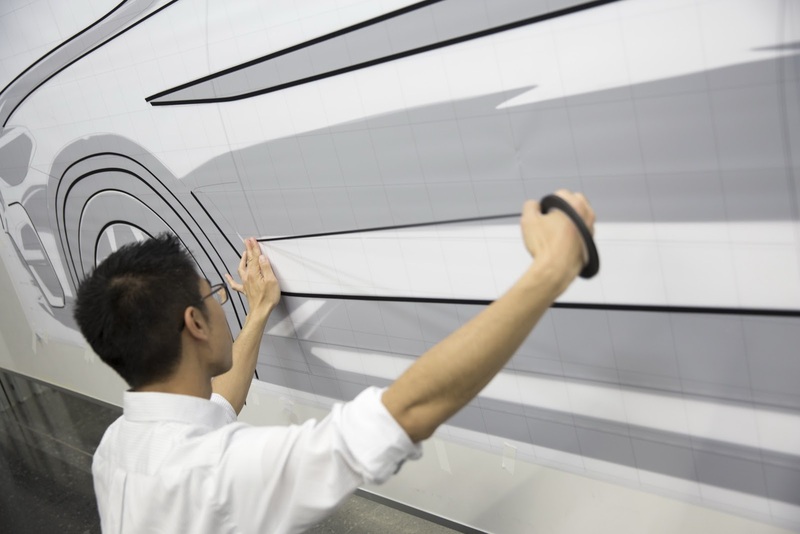 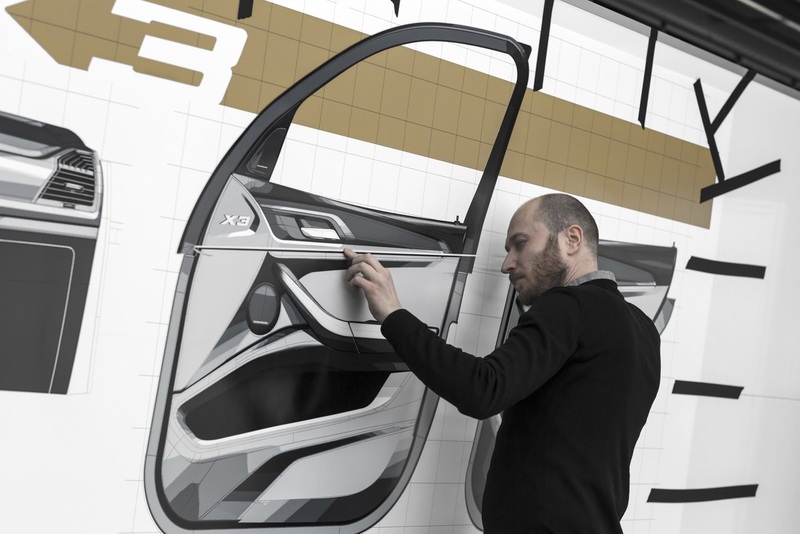 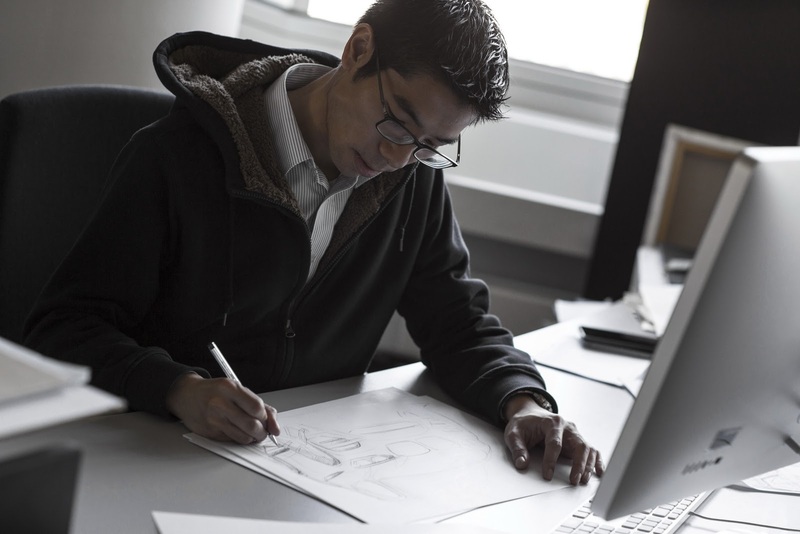 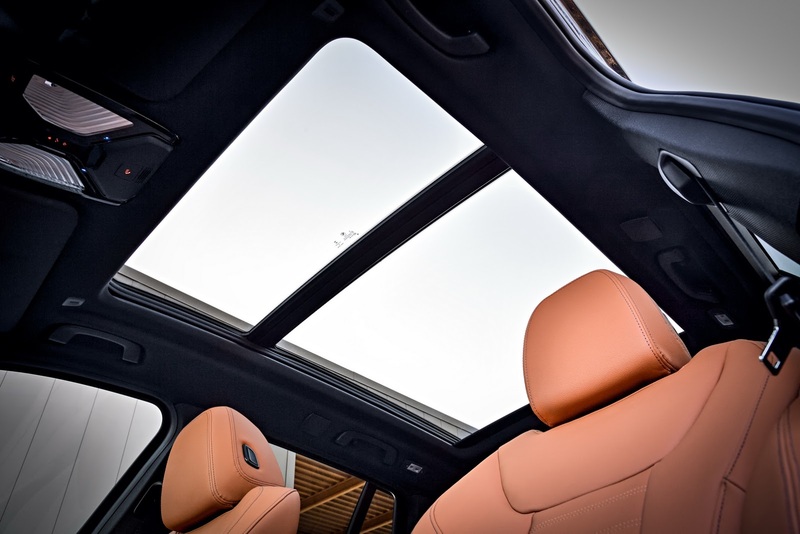 Helping them stay efficient are features such as the BMW Active Kidney Grille, the roof spoiler with Aero Blades at the sides, as well as the BMW Air Curtains. 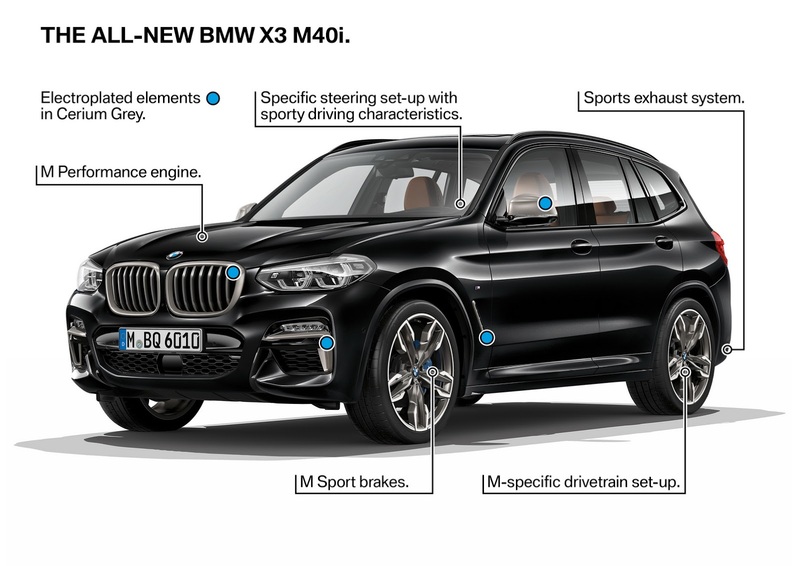 Last but not least, we’ve got the all-new X3 M40i version, the first-ever M Performance model in the X3 model line-up. 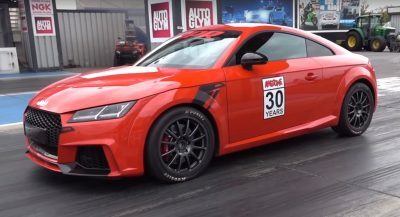 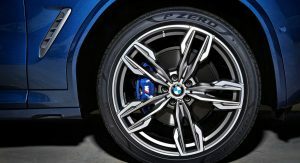 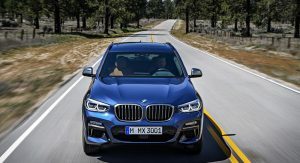 According to BMW, it offers “best in-segment acceleration”, and it’s all thanks to its 3.0-liter M Performance TwinPower Turbo 6-cylinder in-line engine, with an output of 360 PS (355 HP). 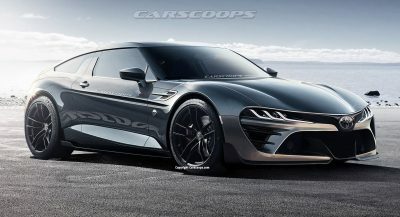 In a straight line, it will hit 100 km/h (62 mph) in 4.8 seconds, and will need just 4.6 seconds to hit 60 mph (96 km/h). 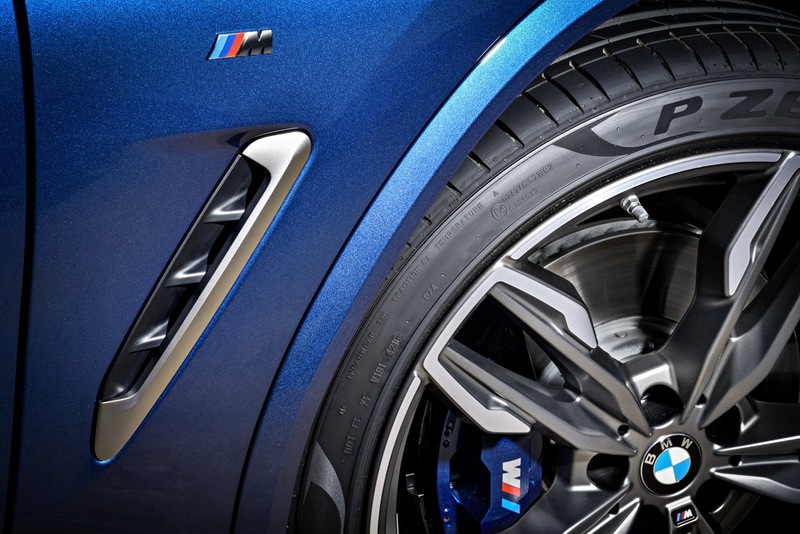 This flagship model also puts down 500 Nm (369 lb-ft) of torque, and will max out at 155 mph (250 km/h). 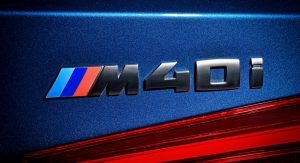 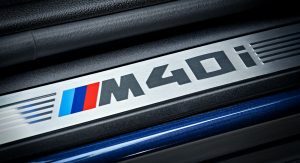 Other M-specific goodies include a Performance Control feature integrated into the DSC system, a more pronounced rear-bias, an 8-Speed automatic gearbox with Launch Control, plus plenty of M40i logos found on the front door sills as well as the instrument panel. 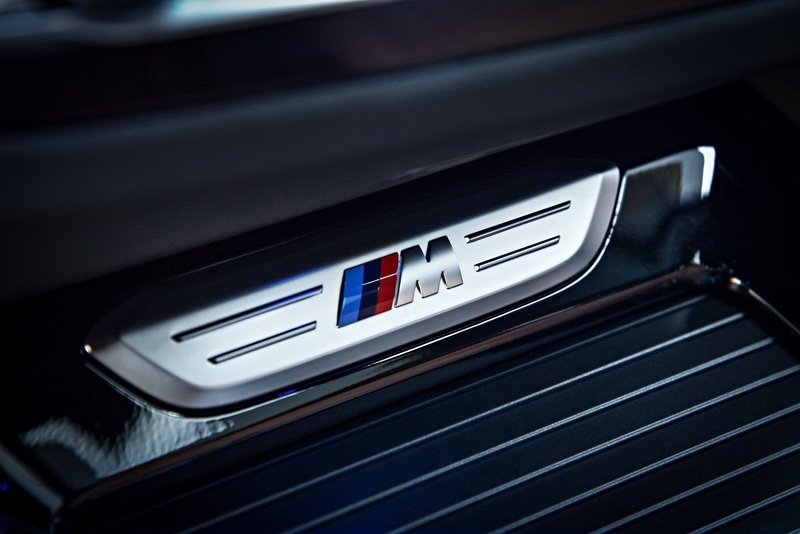 There’s also a flap-controlled M Sport exhaust system with Black Chrome tailpipes, M Sport brakes, M Sport suspension (with M Performance tuning), variable sport steering and an optional Adaptive M Sport suspension. 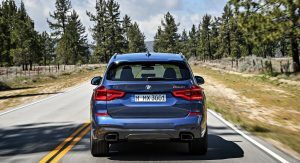 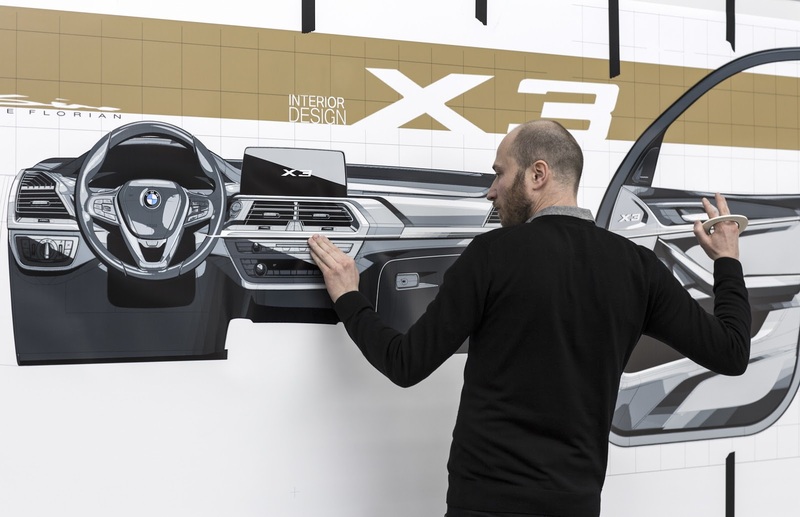 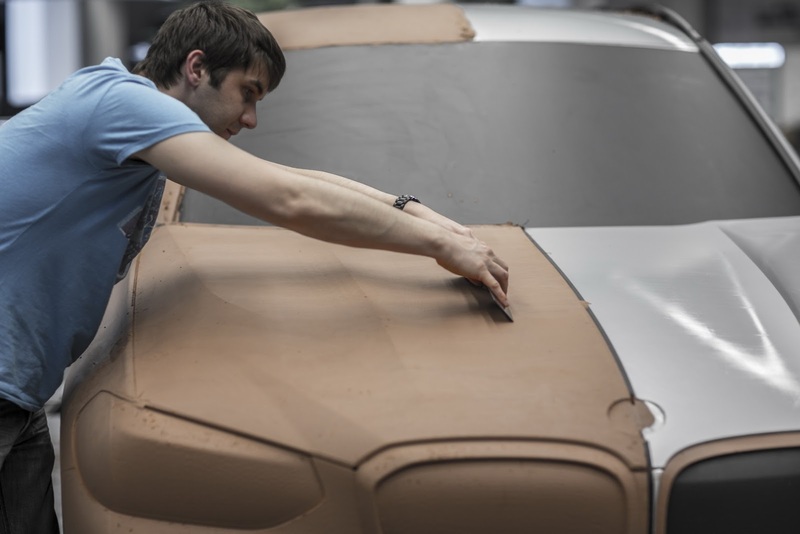 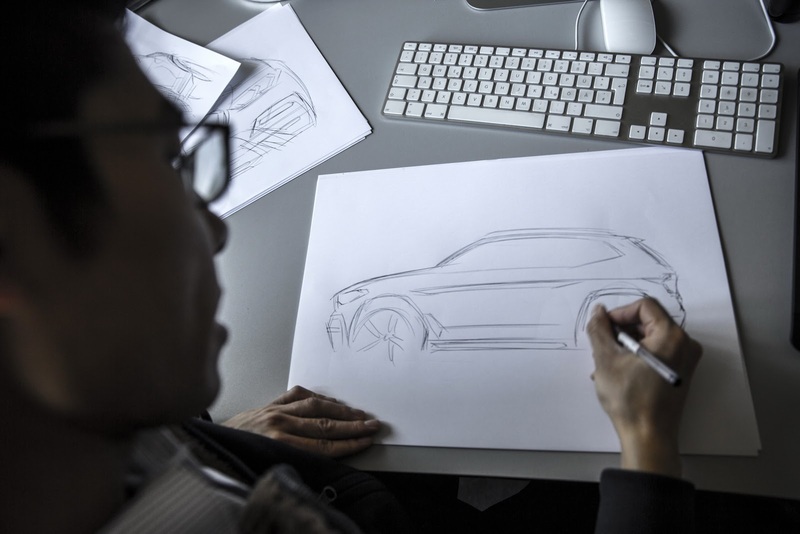 The all-new 2018 BMW X3 will make its world premiere at the Frankfurt Motor Show this fall. 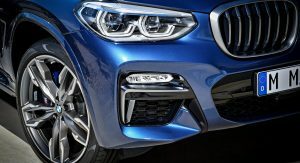 Yet again, Everything else is fine but BMW still leaves the designing of M-Performance bumper to someone who should have been fired ages ago. 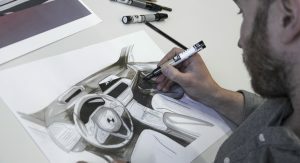 Looks much better than current design. 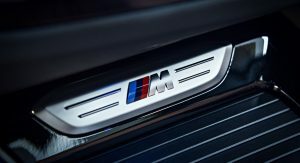 Reliability problems bring the whole brand and badge down. 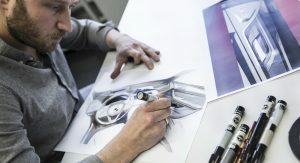 Are they ever going to wake up and stand behind their product for longer than 4 years or do they need to hire Japanese engineers? 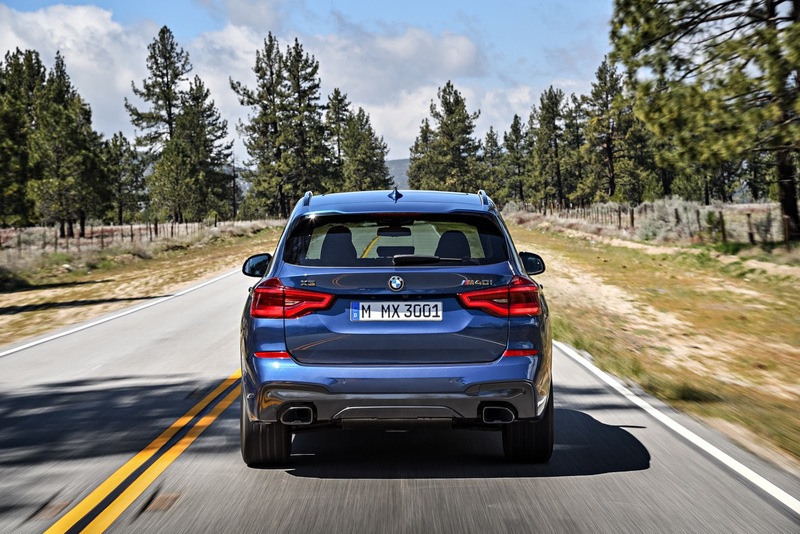 I prefer this bmw x3 over the glc and the q5. I prefer both the GLC and Q5 over this. 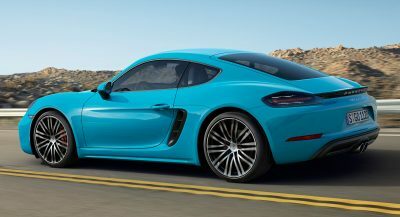 I just wouldn’t. 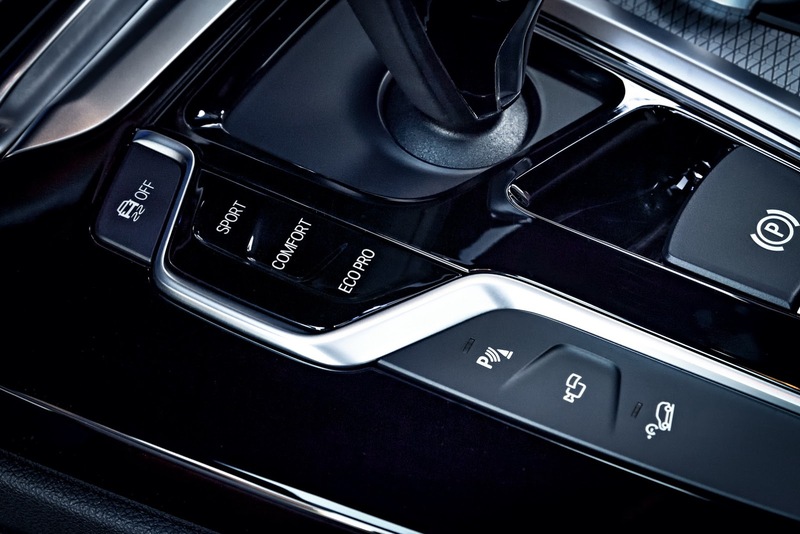 You want that power get a sports car. 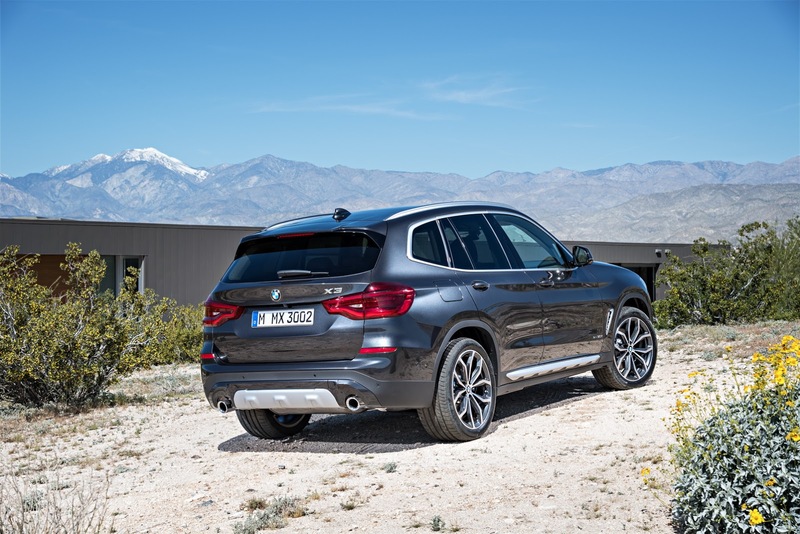 A GLC 43 is fine enough. 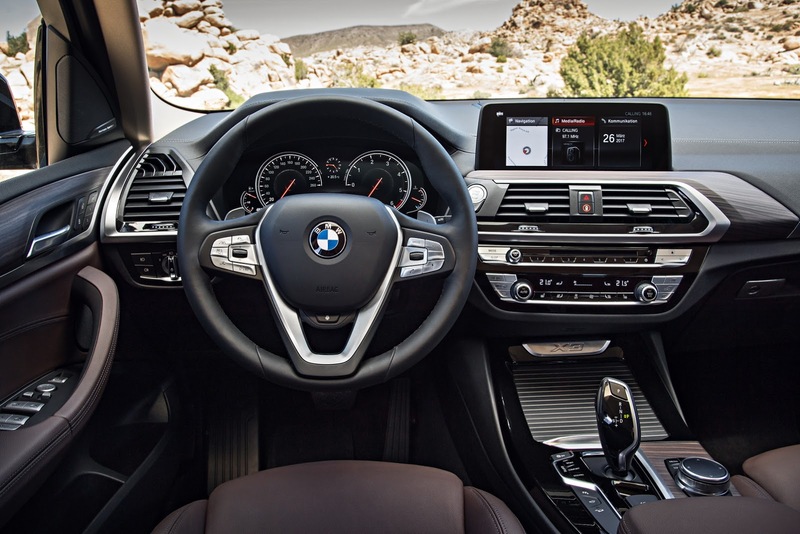 I am not a fan of these screens that arent integrated into the dash, but I dont mind it so much in this car. 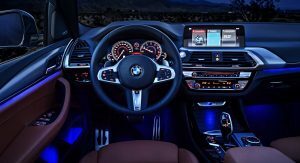 Looks better than the last x3 ,interior looks nice also . 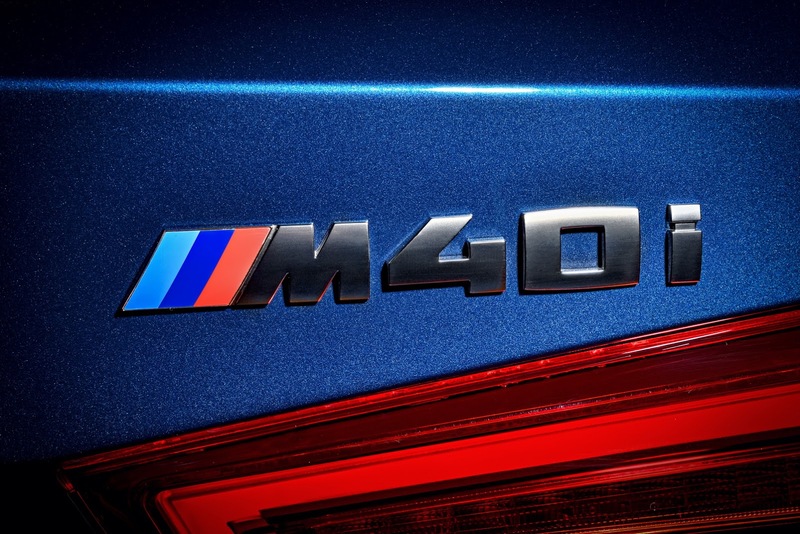 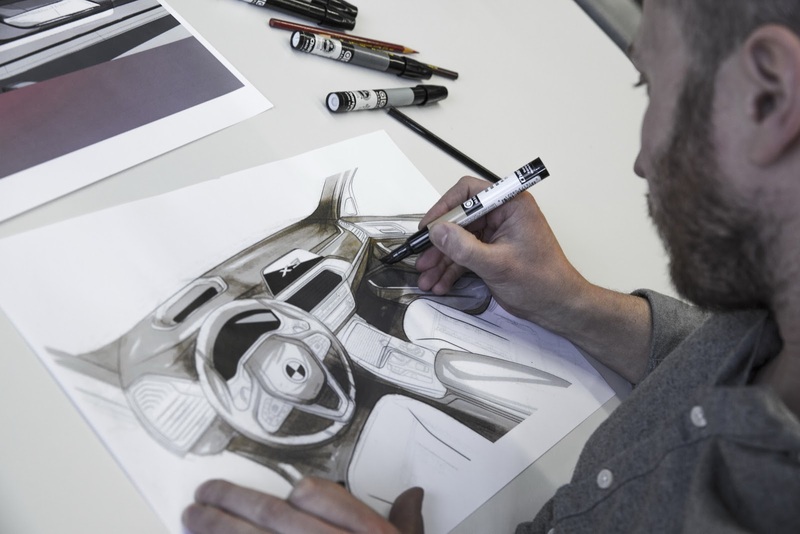 I wouldn’t mind the m40i version ,but I’m sure it will be pricey…. 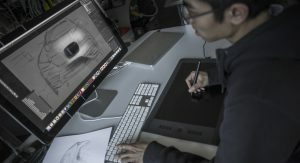 Shoud I open the pictures in full size, or is the same old X3? 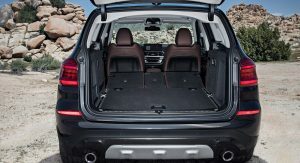 Wonder how the new QX50 will fair against this?! 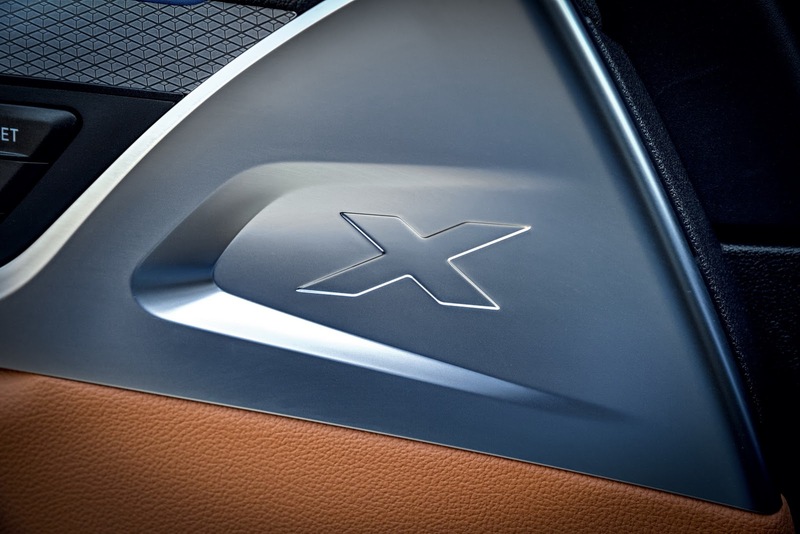 Until the QX50 gets a total overhaul, it doesn’t stand a chance. 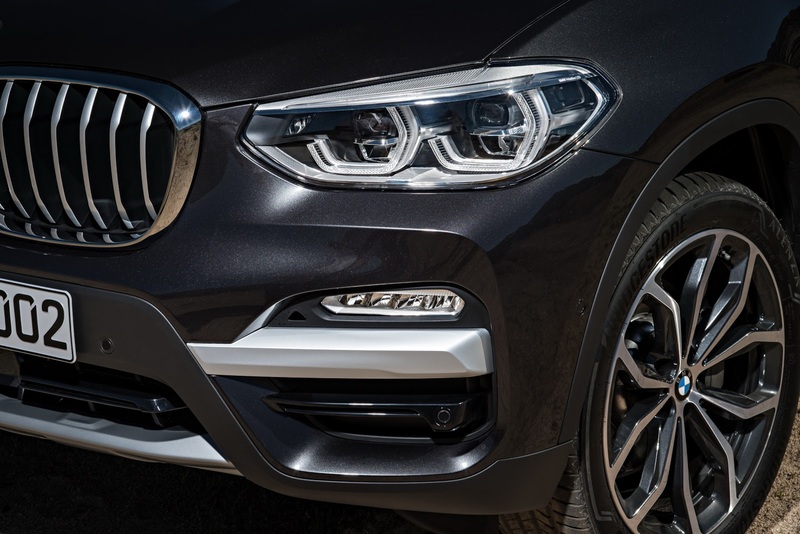 BMWs these days look like they took a bland design, then tried to make it “hip” by overdoing the styling and slapping on a giant grill. 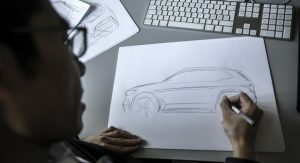 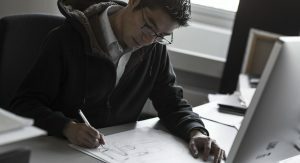 They really need to start with a good sculptural form, as that won’t need the gimmicks to avoid looking dated. 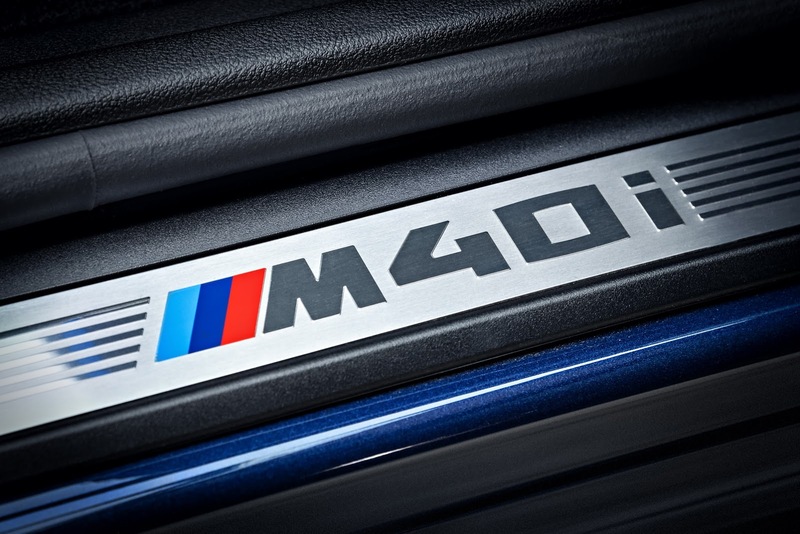 As you said, they aren’t bad, but BMWs used to be something I aspired to. 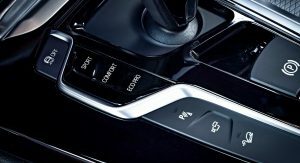 Now I feel like they might as well be expensive German Toyotas/appliances. 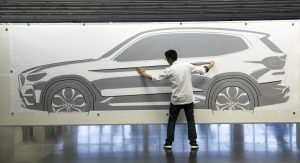 It’s an SUV I guess. 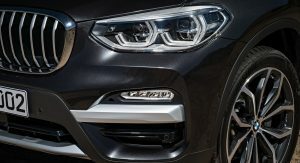 Nice Job BMW! 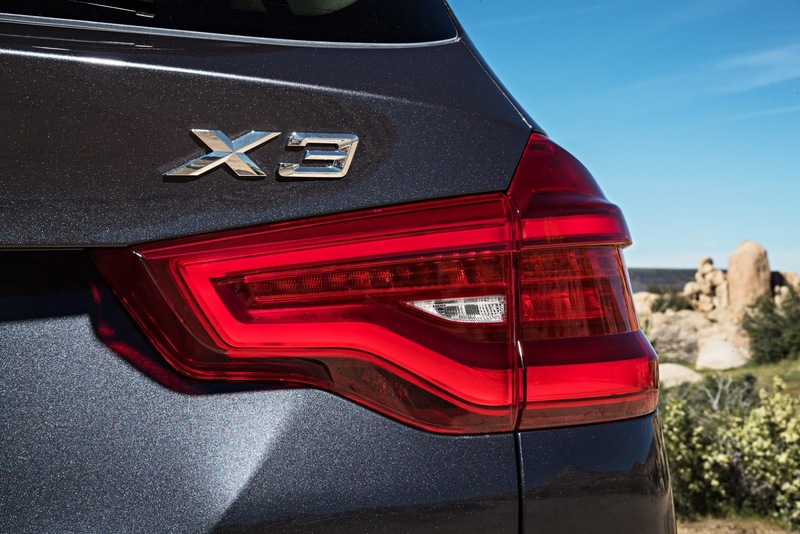 I like the looks of the new Jag, Volvo and Alpha, but for a daily driver this X3 would be it.